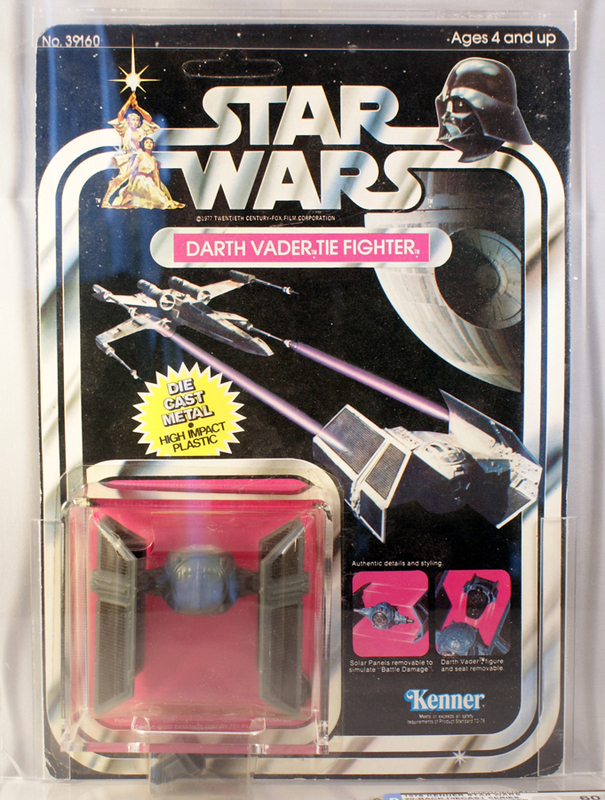 The small wing Darth Vader TIE Fighter is often thought of as the holy grail of die cast collecting with fewer than 50 prototype ships known to exist. 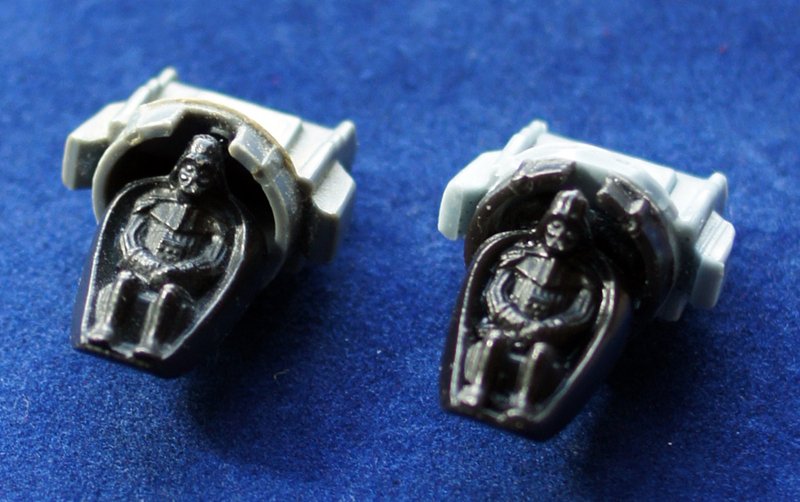 The small wing version is identical to the production Darth Vader TIE apart from the significantly smaller wings. These wings being out of scale with the rest of the ship were subsequently redesigned prior to the TIE going to retail. 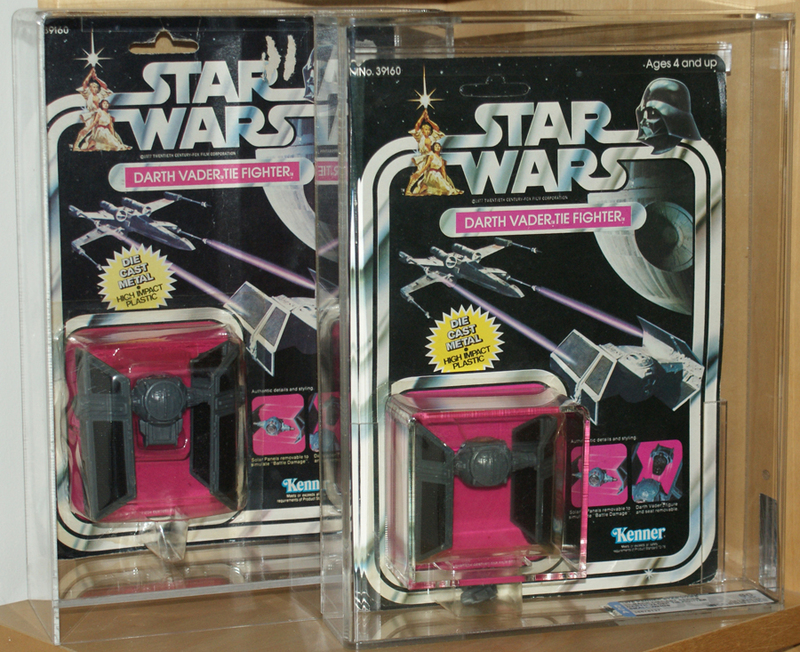 Carded examples of the small wing Darth Vader TIE can be found on two different mock-up cards. The first packaging tests can be found on a SW12 TIE card, with later production-like tests found on an unproduced Darth Vader TIE 20 back - not to be confused with the Canadian production version. The unproduced 20 back demonstrates that the ship was clearly close to production before Kenner decided to redesign it with larger wings. The small wing Darth Vader TIE unproduced 20 back differs from the larger winged TIE's 21 back in a few subtle ways. 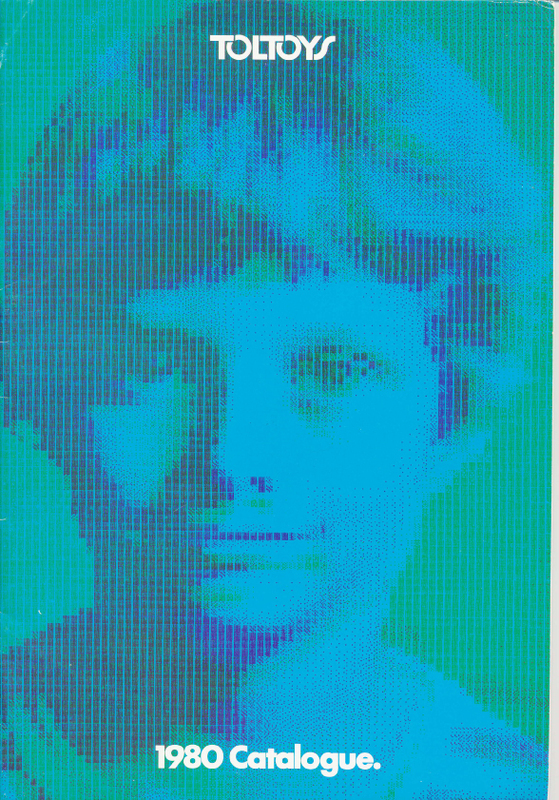 Firstly the sample bubble and backing area was significantly smaller than that used for the production ship and as such there was more room on the card front. This led to more room above the bubble and resulted in a lower placed die cast starburst, and more of the film accurate TIE visible on the card art. Also absent on the sample TIE is the inner tray keeping Darth firmly in the driving seat - with disastrous consequences! Small wing Darth Vader TIE on the right, with large wing TIE on the left for comparison. The obvious main difference on the back is the lack of Boba Fett on the the 20 back, the action figure being released at the same time as the regular die cast Darth Vader TIE. Finding die cast ships in vintage magazines and catalogues is a difficult task. 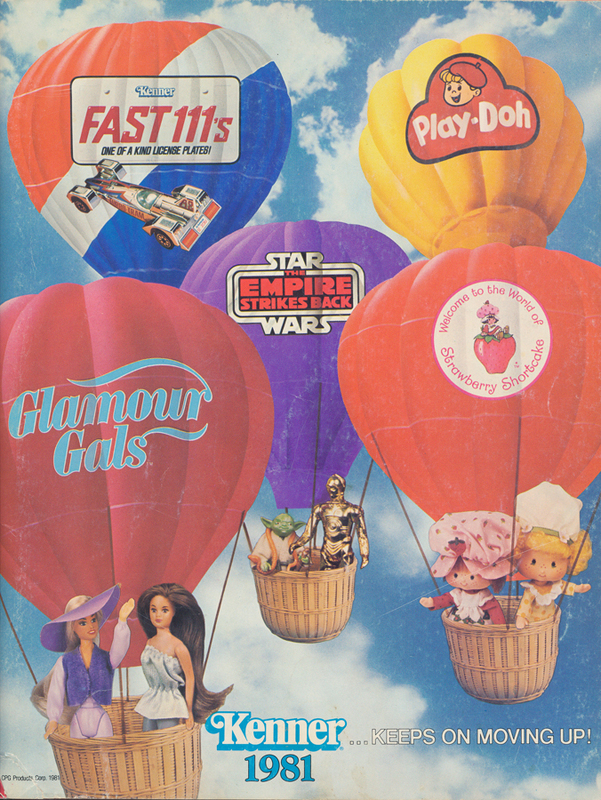 The line's lack of popularity is reflected on the pages of vintage catalogues with toy retailers generally preferring to feature the 3 and 3/4" line of toys. 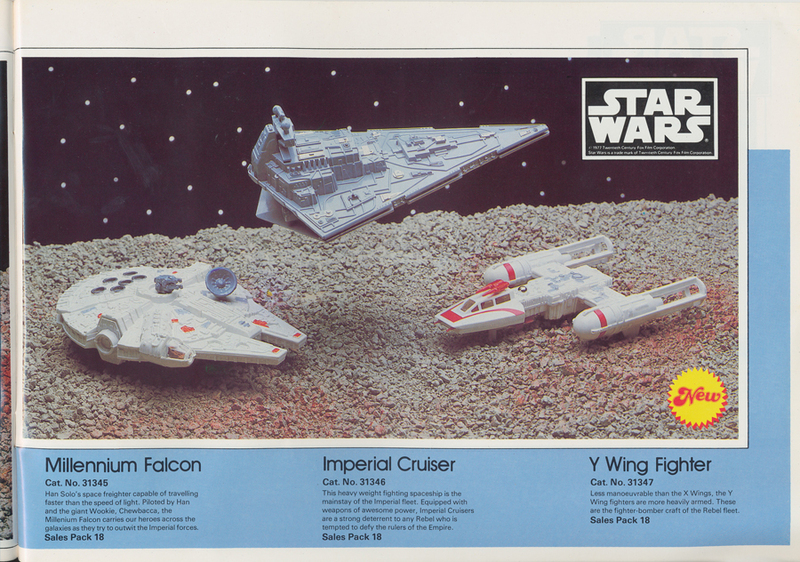 Argos was one of the UK's largest catalogue retailers, and in the seven years it sold vintage Star Wars toys the die cast ships were always absent from its pages. The series 1 ships do feature on the pages of vintage comics, but appear as hand drawn ships due to the high cost of printing photographs in the 1970s. 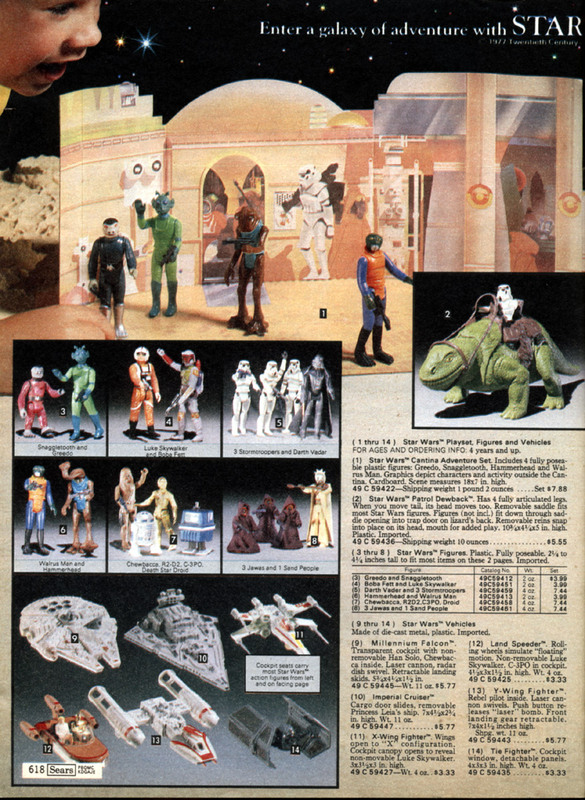 The 1979 advert below featured the iconic first 12 Star Wars figures as well as 11 new characters including Boba Fett and Greedo. 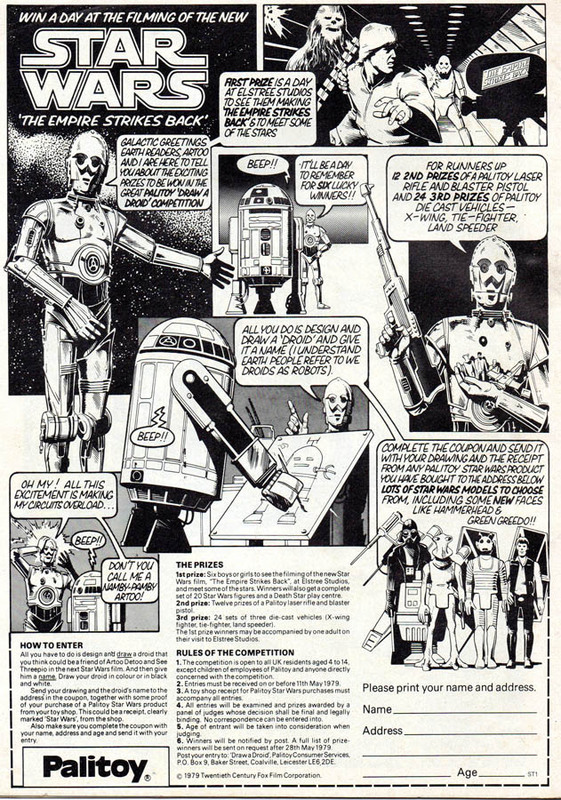 The 'Draw a Droid' competition shown below first featured in issue 60 of Star Wars Weekly released on April 18 1979 in the UK. The competition's fantastic first prize was a trip to Elstree Studios for six children to see the filming of the Empire Strikes Back! The winners also received the first 20 Palitoy action figures and the iconic cardboard Death Star play set. For fans of die cast third prize was just the thing - '24 sets of three die cast vehicles (X-wing fighter, tie-fighter, land speeder)'. In the bottom right of the feature the TIE fighter and X-Wing can just be seen behind two of the newly released Palitoy figures - 'Green' Greedo and Hammerhead. UK comics were printed in cheaper black and white due to a much smaller readership than their US counterparts. 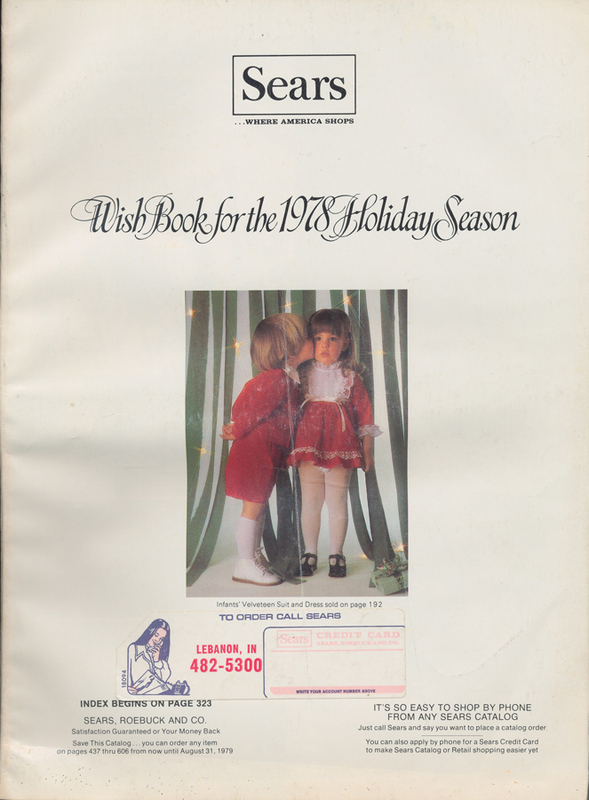 The 1978 holiday season wish book was the Sears debut for the die cast ships, and which featured only two of the first series ships. The Land Speeder was not pictured or advertised in the catalogue, and lends to speculation that the design of the Land Speeder may not have been as advanced in 1978 as the other series 1 ships. It is also possible that the Sears sales team didn’t expect the Land Speeder to sell well and left it out of the catalogue. 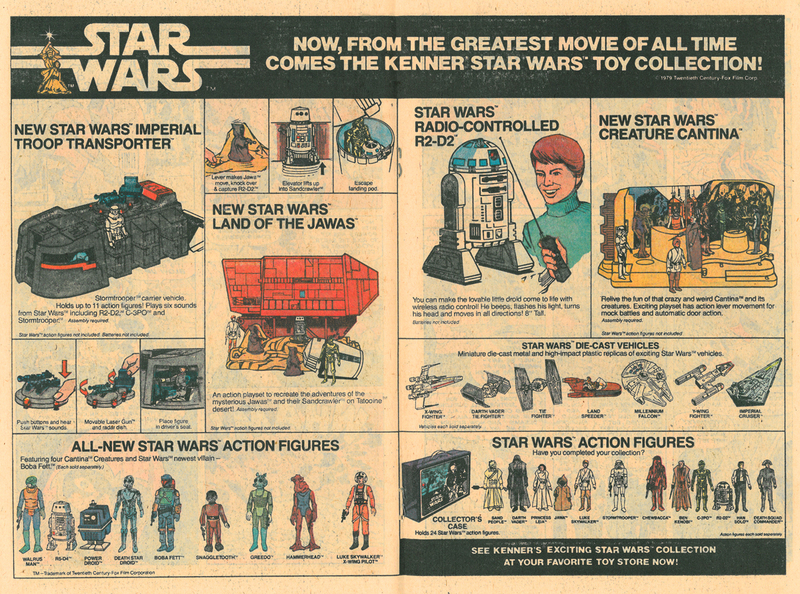 The Series 1 and 2 ships can also be seen in the 1979 Sears catalogue page below but strangely now the TIE is absent. The Series 2 die cast ships were available slightly earlier in the States than in the UK, as was the now iconic bounty hunter Boba Fett. Boba Fett was only sold in the UK once the Empire Strikes back was released in 1980. 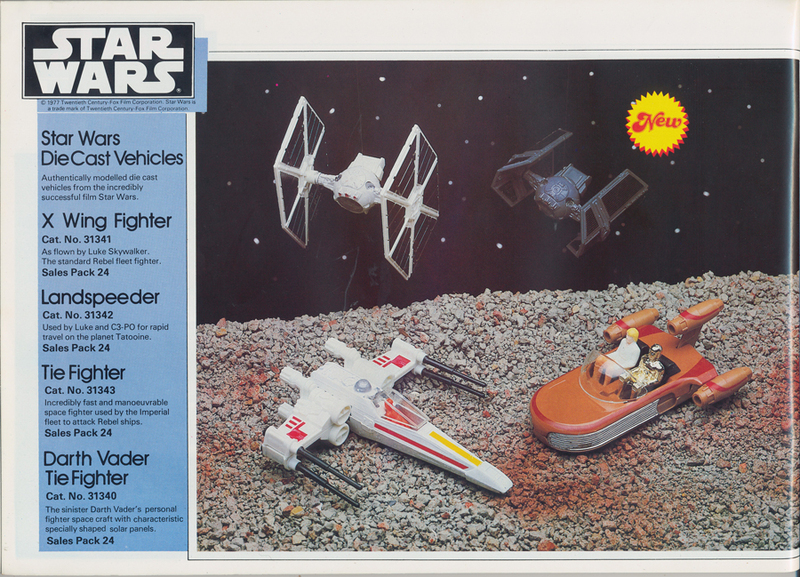 The Seers 1979 catalogue editorial team were clearly a little confused - the die cast 'cockpit seats' would be a little on the snug side for 'most Star Wars action figures.' The Darth Vader TIE is also incorrectly listed as the TIE, but at only $3.33 there could have been few complaints. 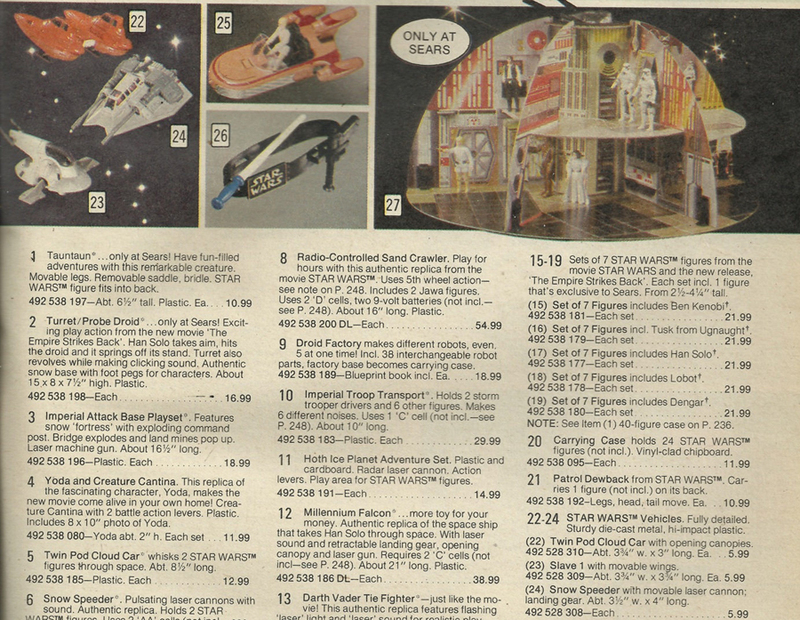 The die cast range also featured in Canadian catalogues, with the Series 1 ships featuring in the 1979 Simpson Sears Christmas Catalogue below. 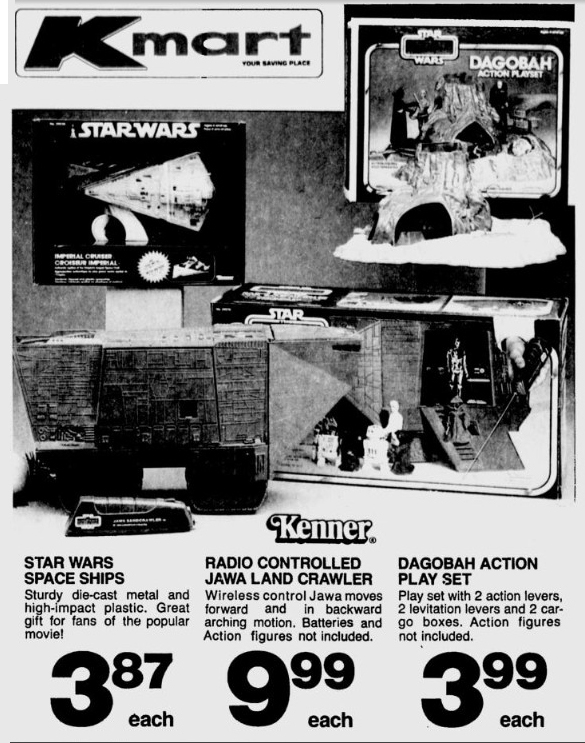 The 1980 Sears Christmas catalogue features the Series 2 ships at $6.99 each. More than a dollar more than in the previous year's catalogue! 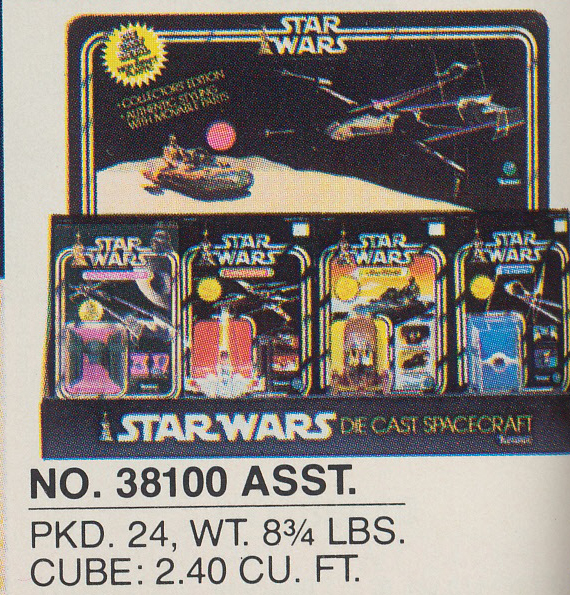 The Series 3 ships can also be seen in this 1980 Sears wishbook, which also features the iconic cardboard Death Star retailing at $26.99. If owners of any of the images above not owned by vintagestarwarsdiecast.co.uk would like them removed please let us know. 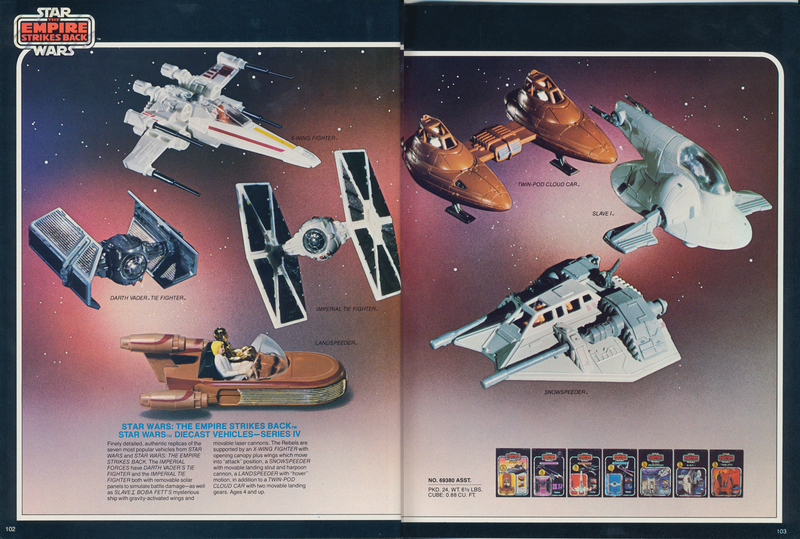 Catalogues sent to toy retailers across the globe are another great source of vintage Star Wars die cast images. The following article is by regular contributor to the site, and collector of vintage catalogues and die cast - Justin Lea. 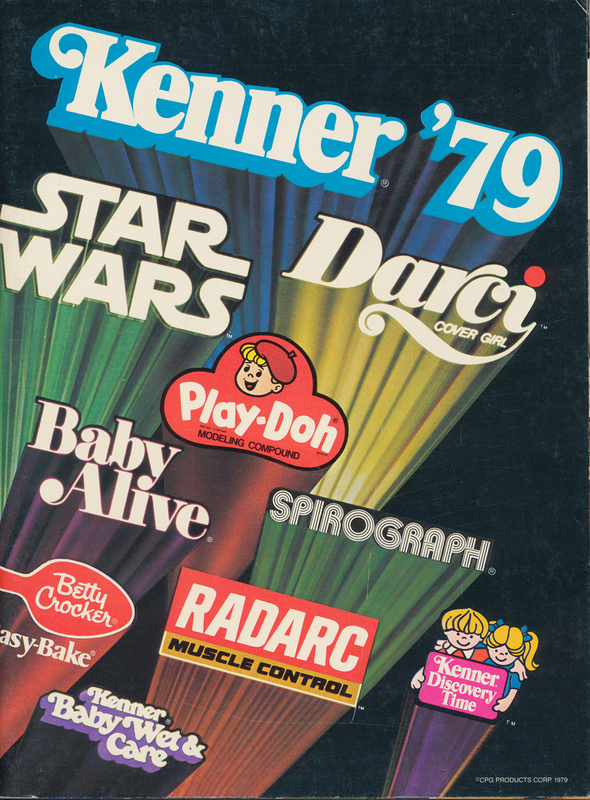 The 1979 dealer catalogue is an excellent example of Kenner's marketing to retailers for each line they produced. Series 1 and 2 are advertised beautifully over two pages highlighting each spacecraft against a glimmering starry back drop. 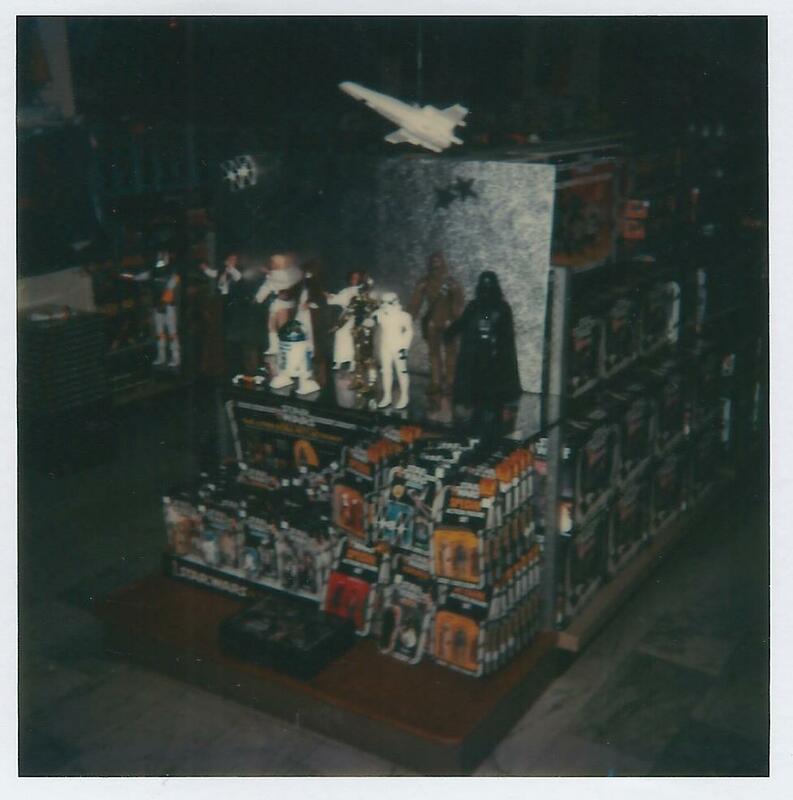 Kenner also gave retailers the option to display their die cast merchandise. 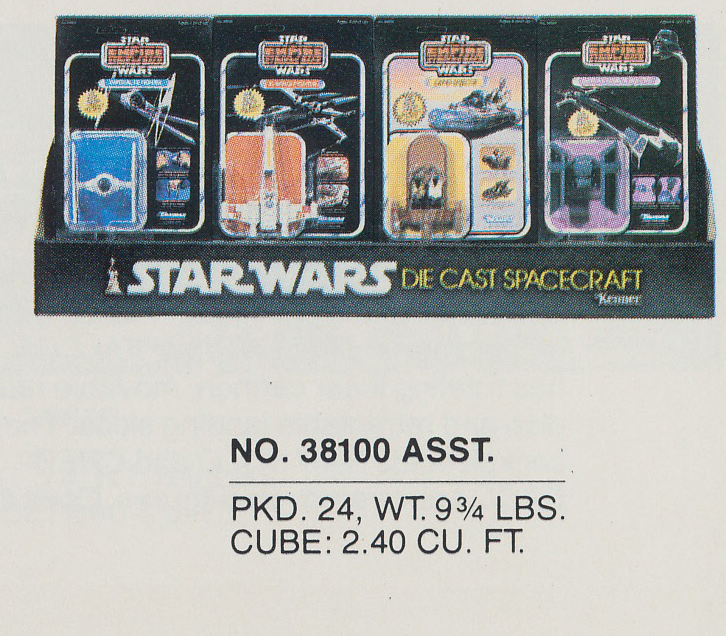 The series 2 header and the extremely rare series 2 bin is also shown in the 1979 catalogue. Kenner marketed “BATTLE READY ADVENTURE” for the series 1 line while “MORE FINELY DETAILED COLLECTOR’S REPLICAS” was used for the series 2 line. 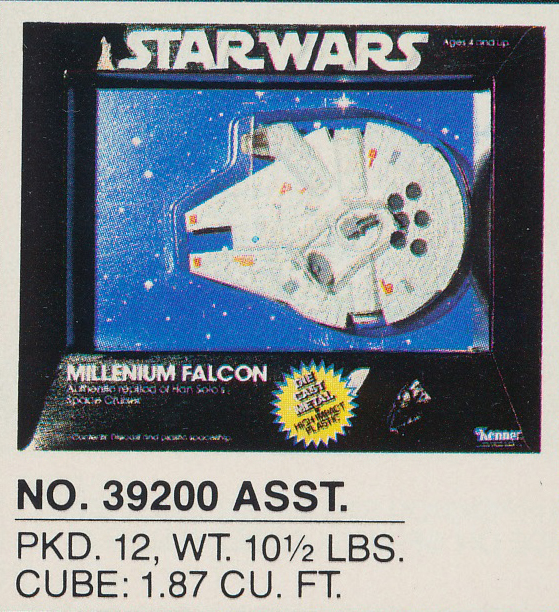 The series 2 images included a mock up of the Millennium Falcon shadow box with an unproduced blue background, and aimed directly at collectors and their display shelves. 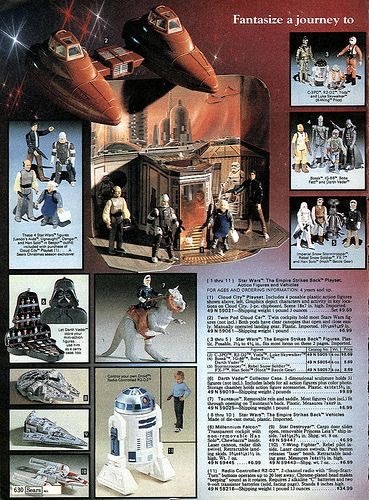 The 1980 dealer catalog was the debut for the Empire Strikes Back toy line from Kenner and a great year for the die cast line with 3 full pages dedicated to the “Finely detailed replicas”. 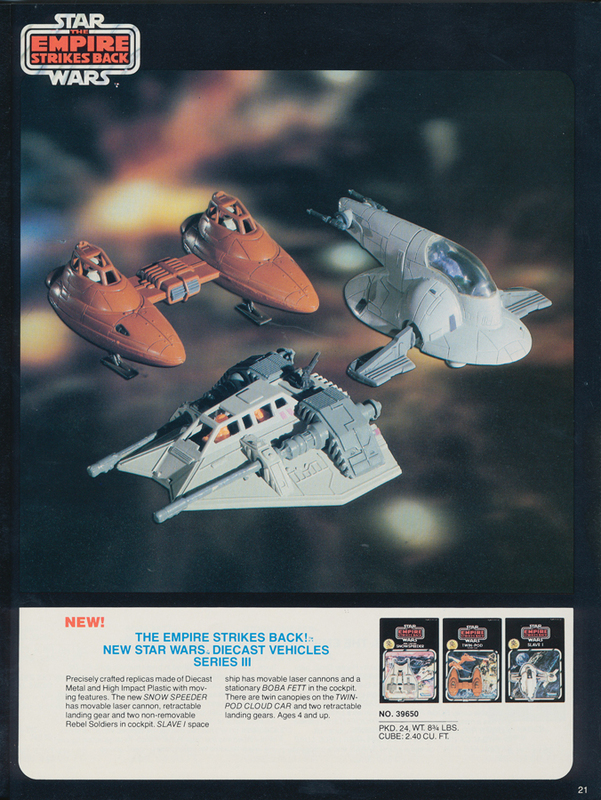 The first page advertised the series 1 vehicles similarly to the previous years catalogue, with the exception of the Empire branded card backs shown in a second issue store display bin. The store display photography shows all 4 of the series 1 craft branded ESB card backs yet only the X-Wing and Tie Fighter ever made it to stores with the Empire Strikes Back logo. 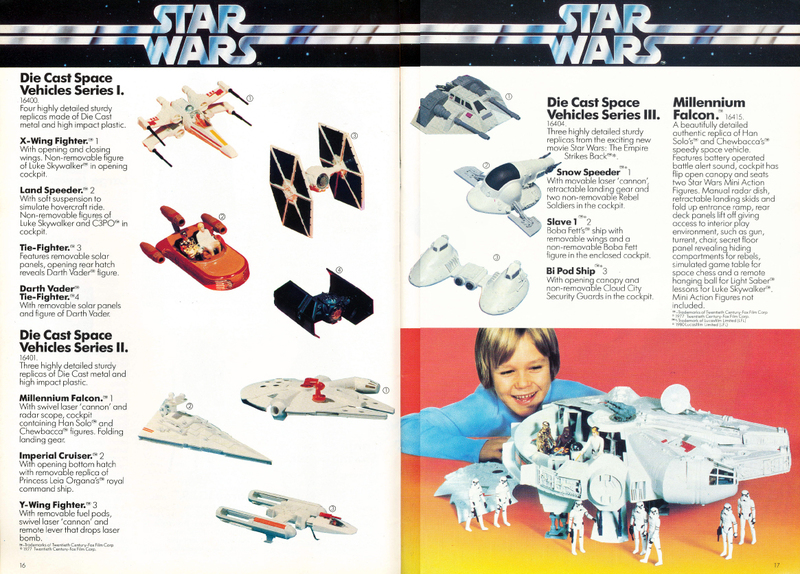 The second page promotes the series 2 vehicles with the addition of the “NEW” TIE Bomber. 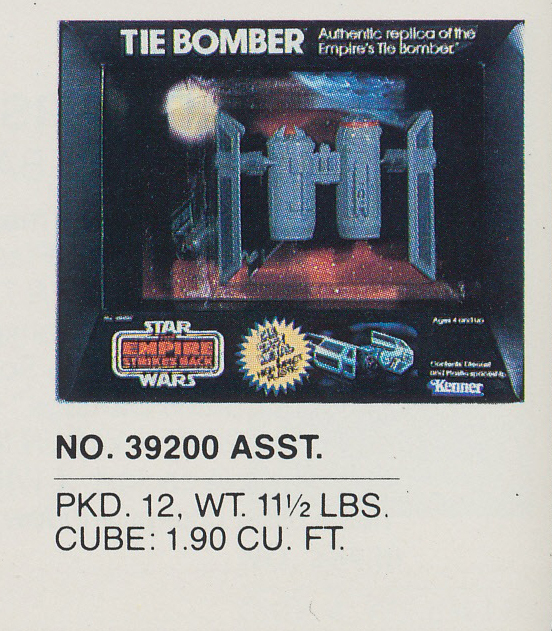 The TIE Bomber pictured is a dark grey prototype that was subsequently changed to white for final production, as were the images of the grey bomber on the box art. 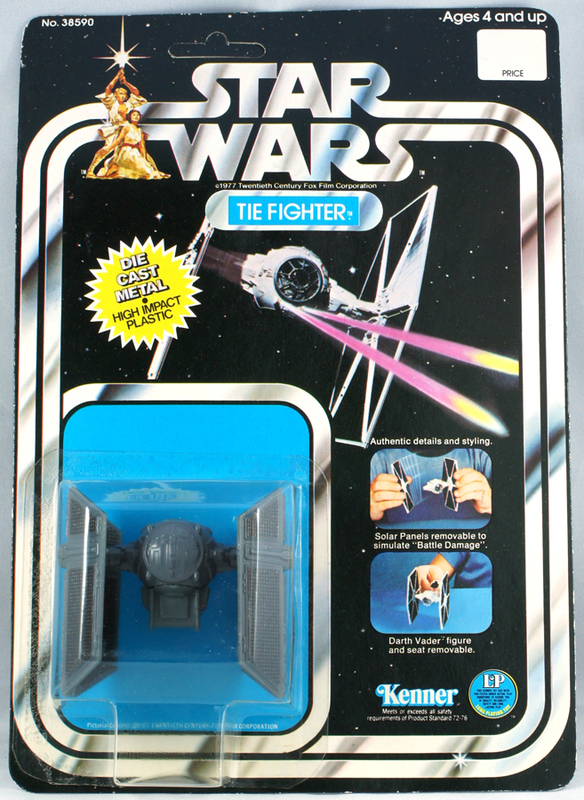 The TIE Bomber is the only spacecraft in the line to have a picture of the actual toy on the main front card/box display while the others had either images direct from the movie or hand drawn artwork. 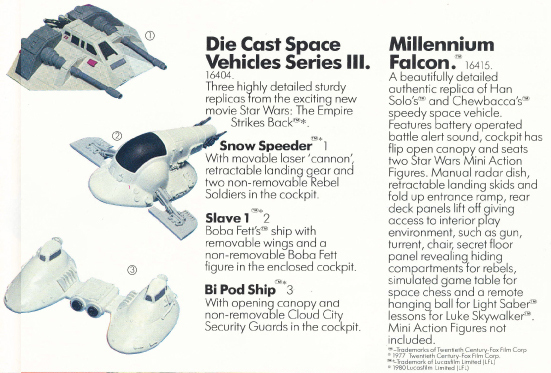 The third page in the 1980 Kenner dealer catalogue debuts the series 3 vehicles that included the Snow Speeder, Slave 1 and the Twin Pod Cloud Car. Kim Simmons' photography on the page is clear, sharp and even highlights the hand painted Snowspeeder guns with flaking paint. Each ship is featured on a mock-up cardback, giving a glimpse of the early artwork and what might have been. The Snowspeeder and Slave 1 cardbacks are very close to the final product, whereas the Cloud Car was completely changed. 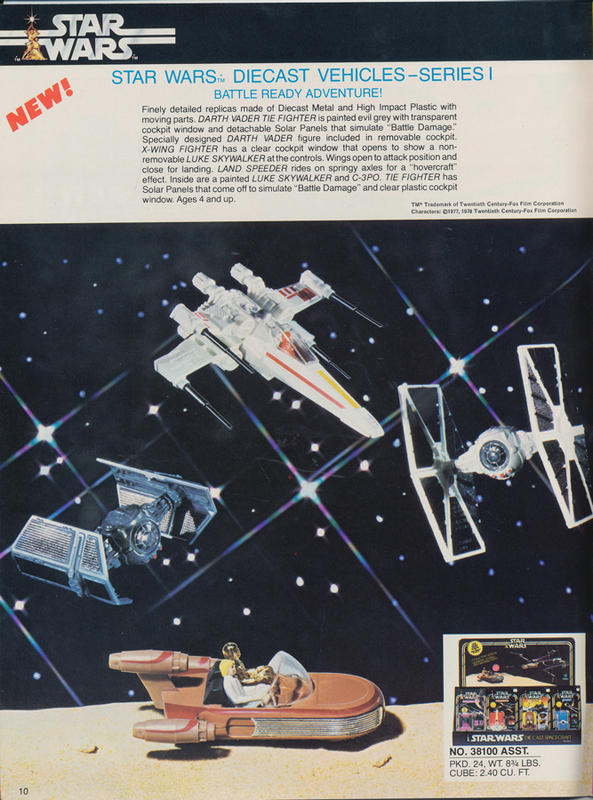 The 1981 catalog features a two page spread of previously used images to promote the second year and ultimately end of the Empire Strikes Back die cast line. The major standout on these pages are the ESB branded cards that still advertised the Darth Vader TIE and Land Speeder as available on ESB cards; packaging that never made it to stores. 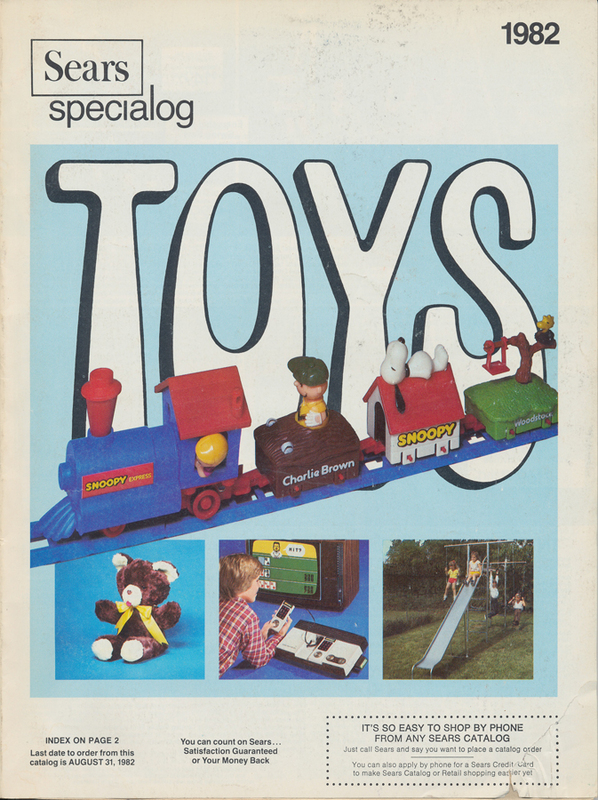 The 1980 Toltoys catalogue below was issued to toy dealers in Australia and New Zealand. The die cast pages feature the Series 1, 2 and 3 ships, and interestingly the images used for the Series 2 and 3 ships are all of protoypes. The Millennium Falcon, Y-Wing and Imperial Cruiser are the images featured on the back of the SW7 boxes - despite the toys having been in production for at least a year. The Series 3 ships were not yet on general release although the Snow Speeder is very close to the production toy. The 'Bi-Pod ship' represents the Twin Pod Cloud Car, and clearly both this and Slave 1 are at a very early stage in their design. The text states that the Slave 1 has 'removable wings' and the Bi-Pod ship an 'opening canopy.' Neither of these features made it into production. 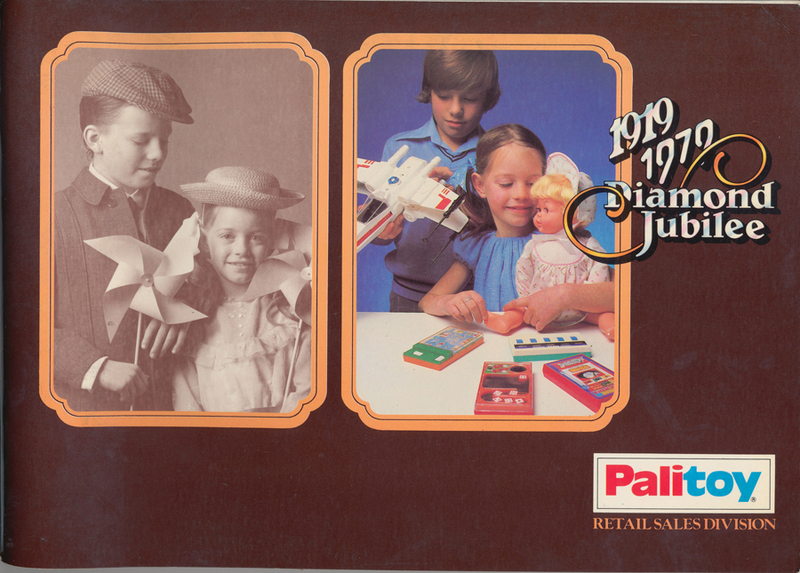 The 1919-1979 Diamond Jubilee Palitoy trade catalogue celebrated 60 years of the Palitoy company. 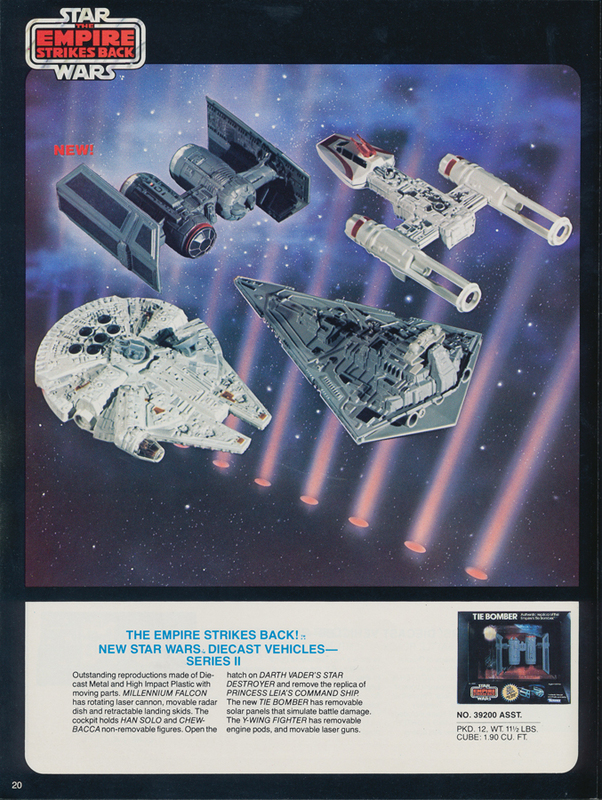 The catalogue featured the series 1 and 2 die cast space ships, with Darth Vader's TIE Fighter and the larger space ships all labelled as "NEW". The main points of interest are the continual confusion over which way up TIEs are meant to go and how to spell Millennium. 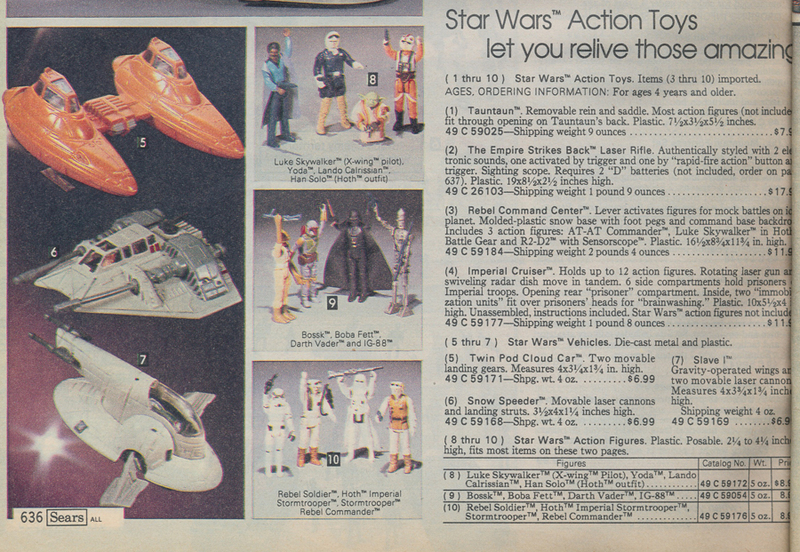 Trade prices for the die cast line feature in the Palitoy catalogue. At £1.39 for the Wave 1 ships they were almost twice the 68p fee for the carded 3 and 3/4" figures that featured in the same catalogue. The smaller ships came in boxes of 24, whilst the larger ships in boxes of 18. 1970s price stickers tell us that the Wave 1 ships retailed in stores from anywhere between £1.98 and £2.64 and the Wave 2 ships retailed for up to £3.80. Trade mark up can be seen to be between 40% and 90% for Wave 1 and over 100% for the Wave 2 ships in Taylor and McKenna stores! This trade invoice from Miro Meccano shows a La Voulte-sur-Rhone shop order for six X-Wings (Chasseur X), six TIE Fighters (Chasseur TIE) and six Land Speeders (Aeroglisseur). There is a bulk discount of 2% on the usual 18 Franc price, which is roughly equivalent to £1.80 in 1981, and more in line with the larger ship price in the UK. 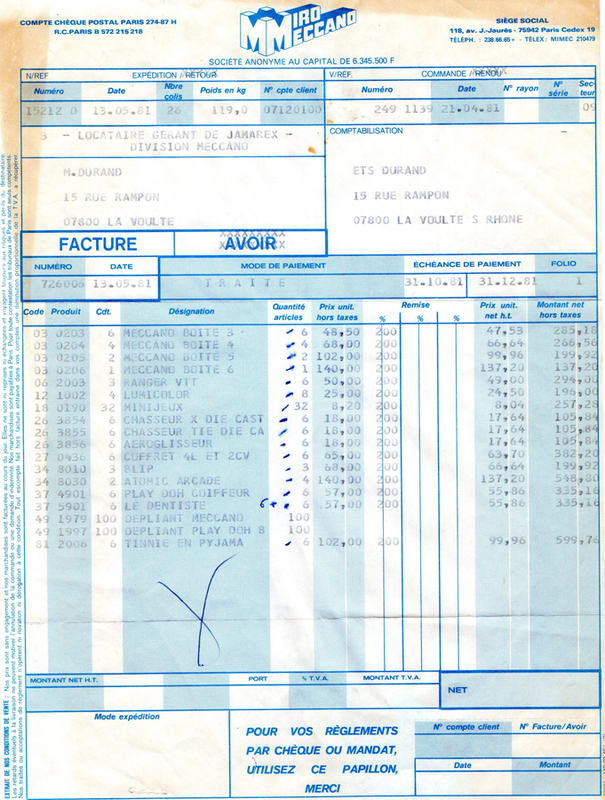 The invoice also demonstrates that Star Wars carded ships were still being manufactured in France in 1981, one year after the release of The Empire Strikes Back. 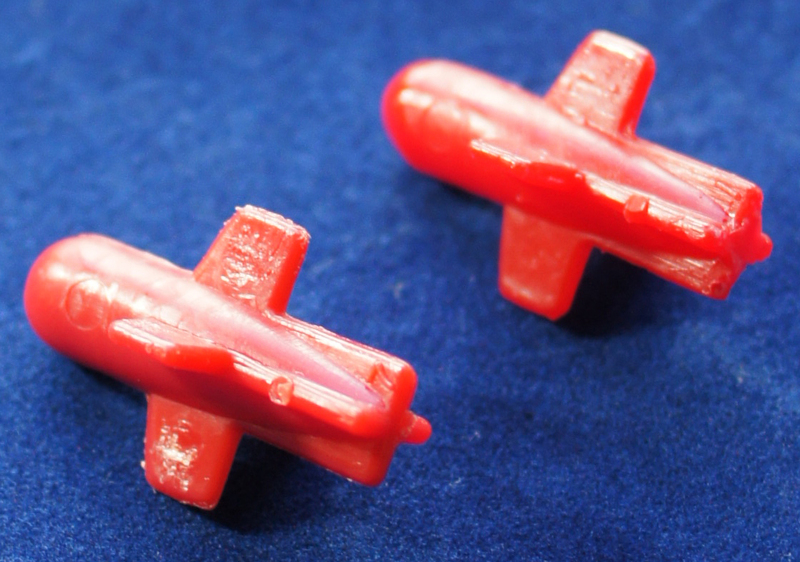 Bombs for die cast Y-Wing fighters have been reproduced for several years but reproduction die cast parts are not common and still not something to be overly concerned by. Due to the unpopularity of the die cast line the repro parts that are available are made in small quantities, and as such are relativley expensive and can cost more than an original part. Although still rare, these reproduction parts are being made in ever increasing quantities and for a wider range of ships, and the quality of those currently on the market makes them difficult to tell apart from the originals. 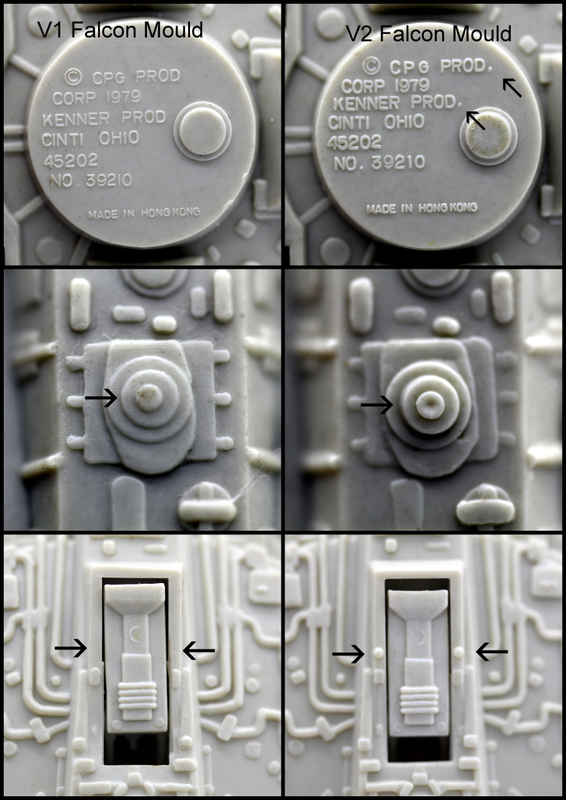 The guide below provides some useful tips to tell an original part from some resin repros that are currently on the market, and will help stop unsuspecting buyers picking up repro parts in error. The reproduction X-Wing cockpit glass below is a very good match for the original the only clear difference being more air bubbles in the plastic, and not quite a perfect fit on the X-Wing. 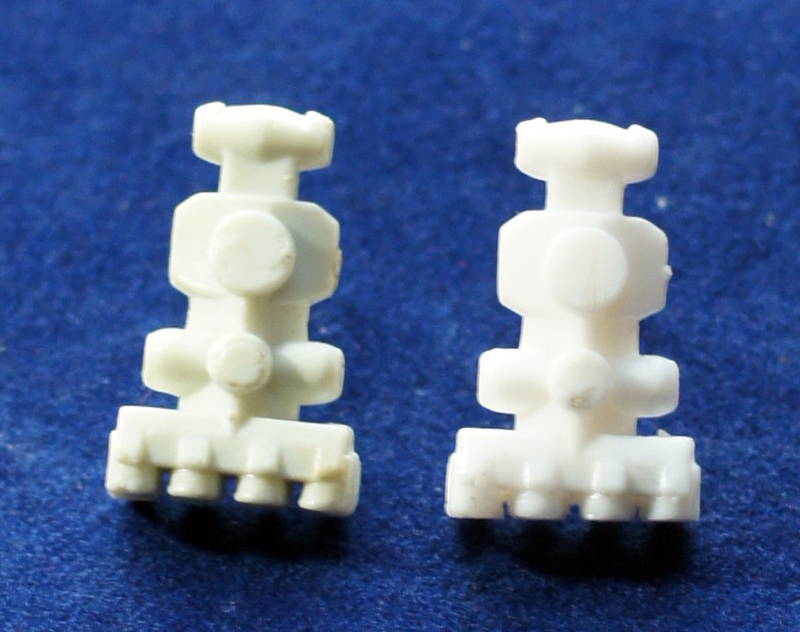 The repro Blockade Runner below is very difficult to to tell apart from the original part. 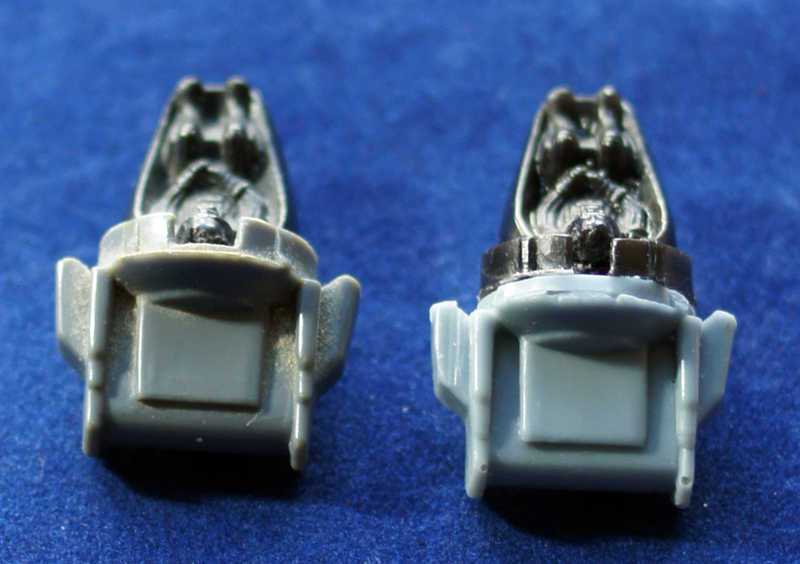 Both have circular mould marks in identical places but the the original part has a mould line on the rear of the engines that is absent from the reproduction piece. The reproduction Y-Wing bomb below is much shinier than the original and the detail is less sharp. Both the original and the reproduction have a part number stamped on one fin of the bomb, but the original '7' is much crisper than the '1' of the repro. The original and repro bomb both have circular mould makes in identical places. Original Y-Wing bomb on the left and repro on the right - note the crisper detail of the '7' than the '1'. 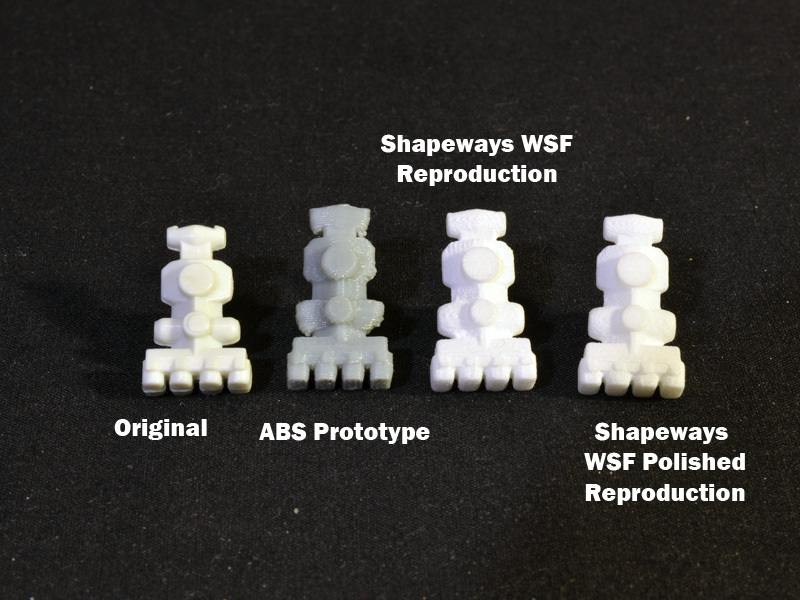 The rise in cheap 3D printing is also resulting in more reproduction parts, but as yet these still require a lot of hand finishing and should not be mistaken for original. 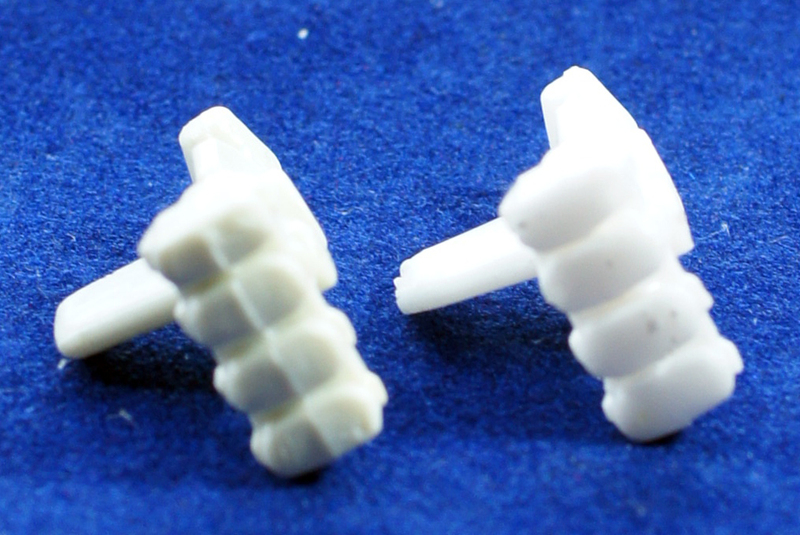 Reproduction parts are here to stay and it is encouraging to see responsible sellers such as Shapeways https://prometheusrising.net/2014/01/07/prhi-blockade-runner/ mark these 3D printed Blockade Runners with a groove on the top fin. 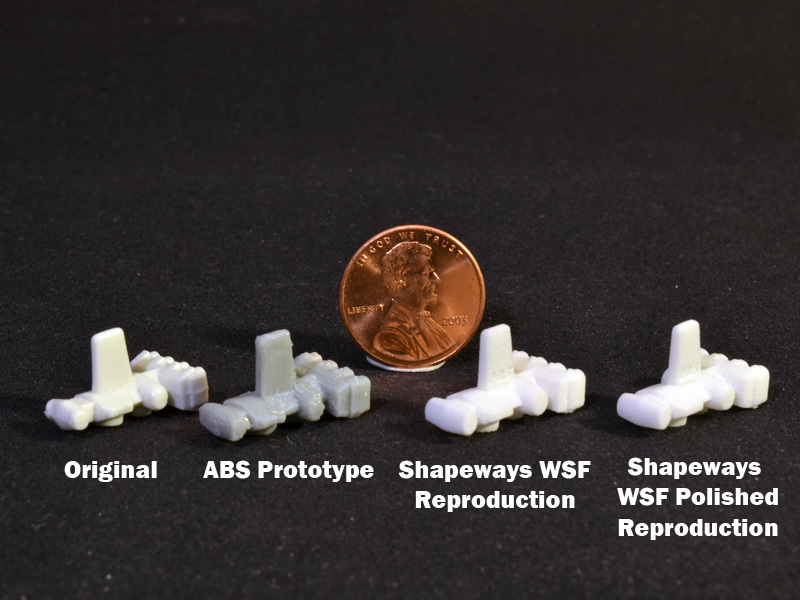 The 3D printed reproductions are more flexible than the originals and not as finely detailed. Like the resin reproduction the mould line is absent from the rear of the engines. 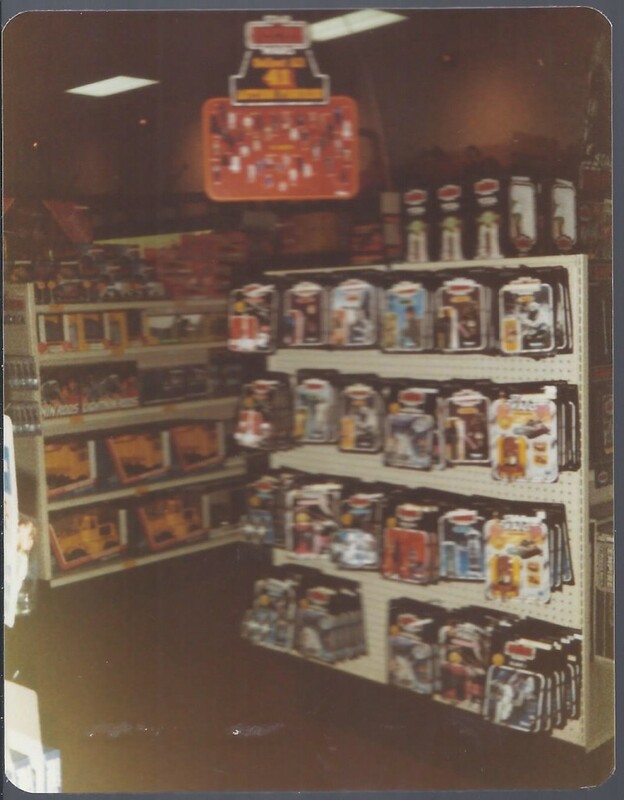 Like today stores in the 1970s used colourful displays to sell their toys. 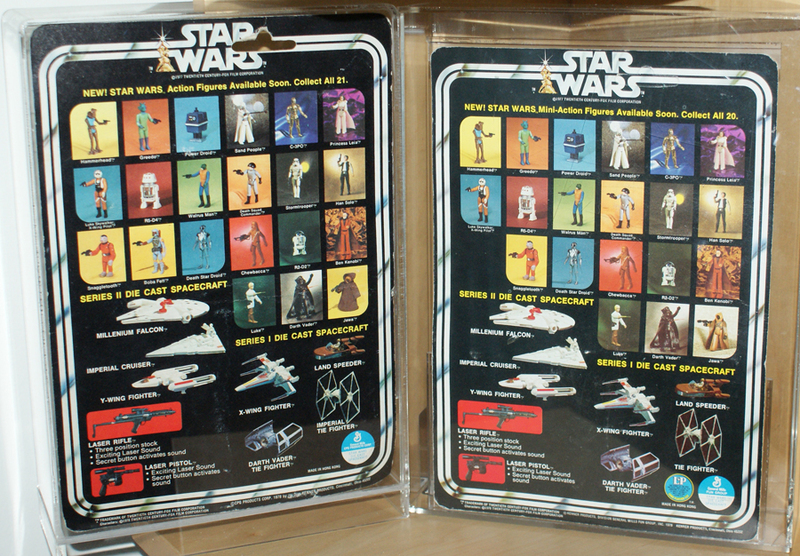 Kenner used a wide range of toy bins, headers and signs for the vintage Star Wars line. 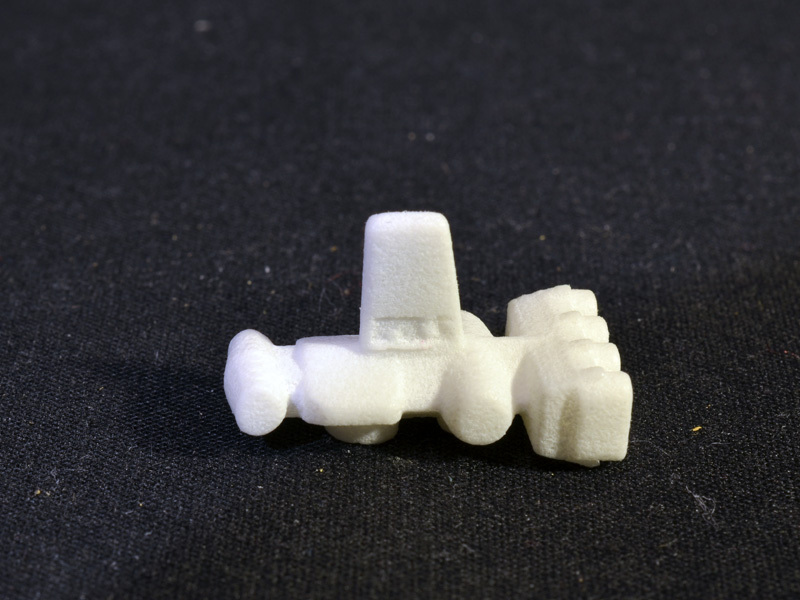 The carded die cast vehicles could be found in simple cardboard bins with a header attached to the back. The 'die cast metal and high impact plastic' toys feature prominently on an oversized starburst. 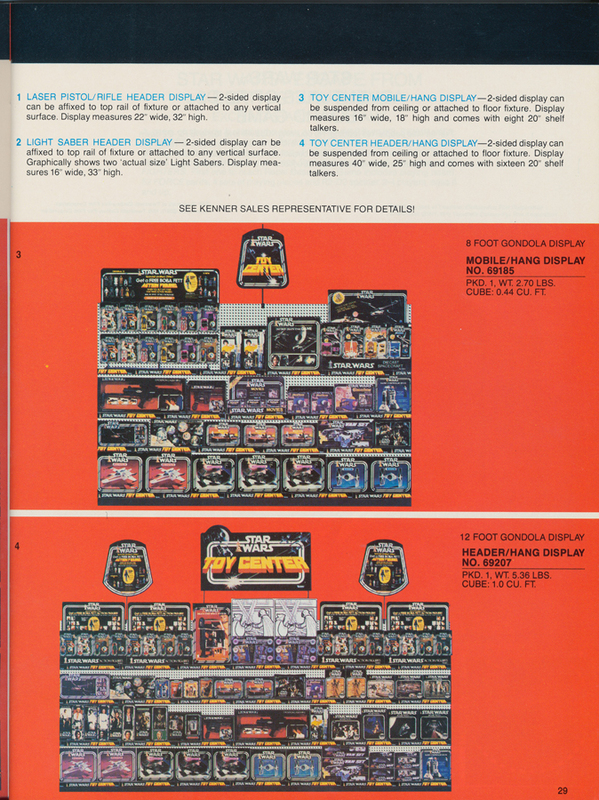 With 'Collectors' edition' displayed prominently, these headers reinforce the idea that the die cast line was intended as a collectable range of toys. This limited appeal was the likely reason for the short-lived availability of the line. 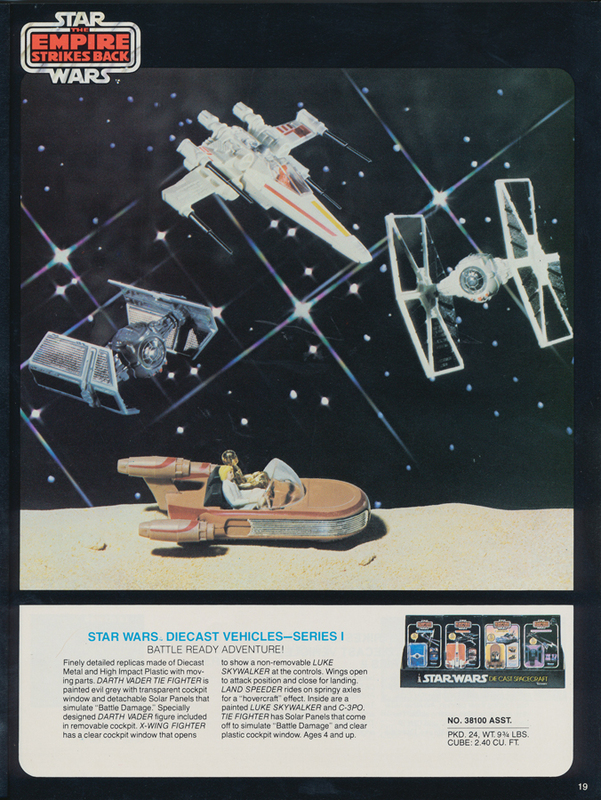 Two headers were released for the Series 1 vehicles with the first issue featuring movie images of the Land speeder, X-Wing Fighter and TIE Fighter. A second issue header was distributed to stores with the release of the Darth Vader TIE. 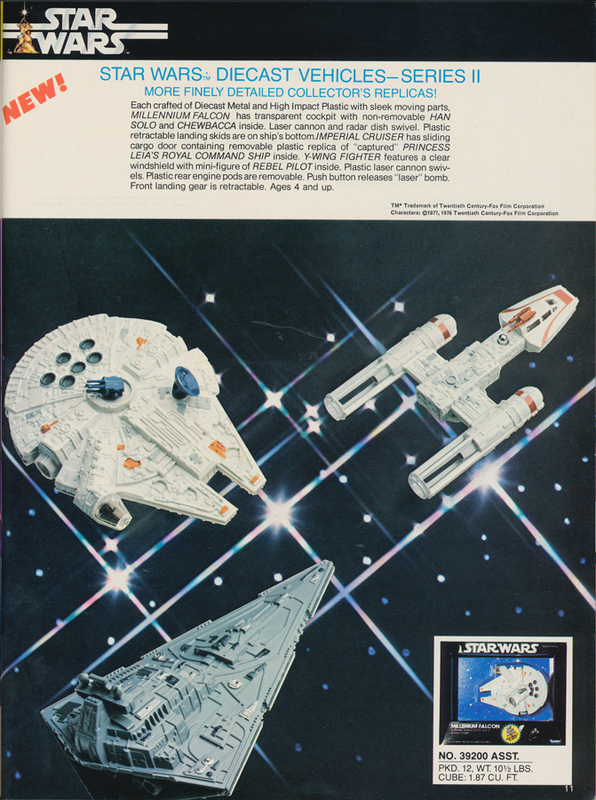 This change resulted in a Darth Vader TIE joining in the attack on the X-Wing, as well as the removal of Kenner's LP (long play) logo. The font colour of 'Collectors' edition' and 'authentic styling with movable parts' changed from yellow to white on this second issue header. The first issue bin formed a box with an inserted tray for the carded ships. 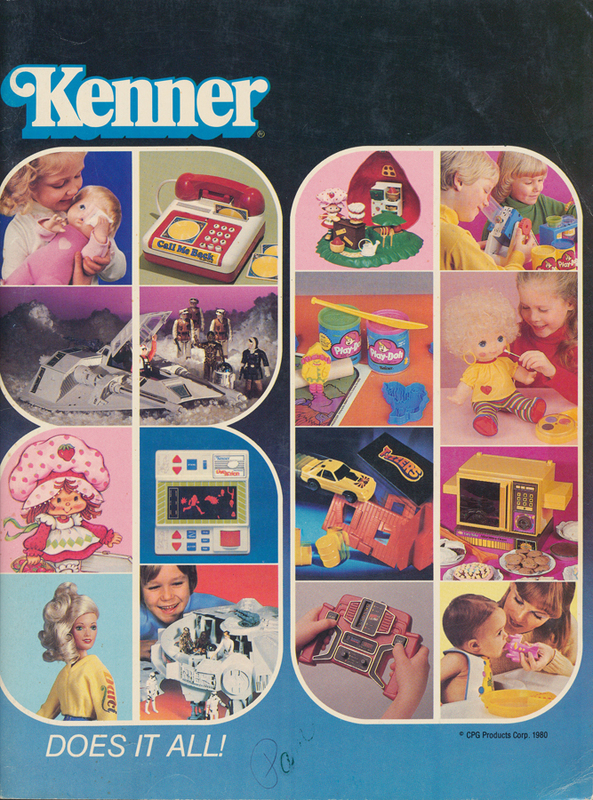 The first issue die cast bin can be seen top right in this image from a Kenner catalogue sent to retailers. 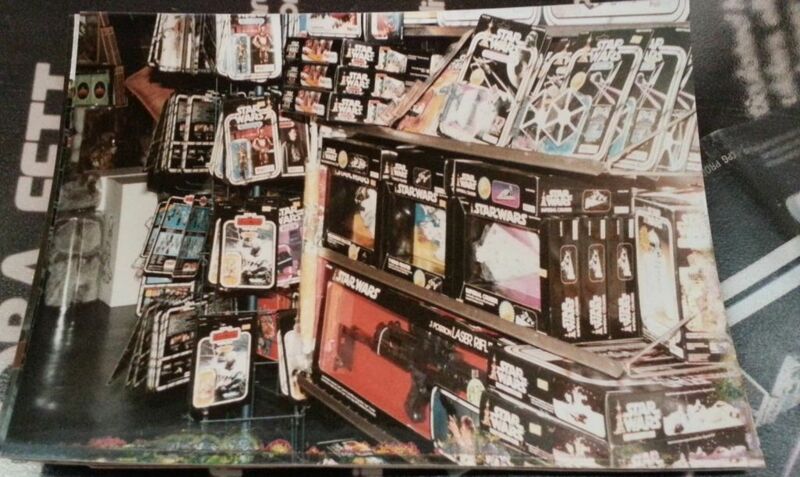 The page details various Star Wars displays that could be used in-store. Image courtesy of Justin Lea. Kim Simmons publicity photos show an apparently unreleased Empire Strikes Back bin. 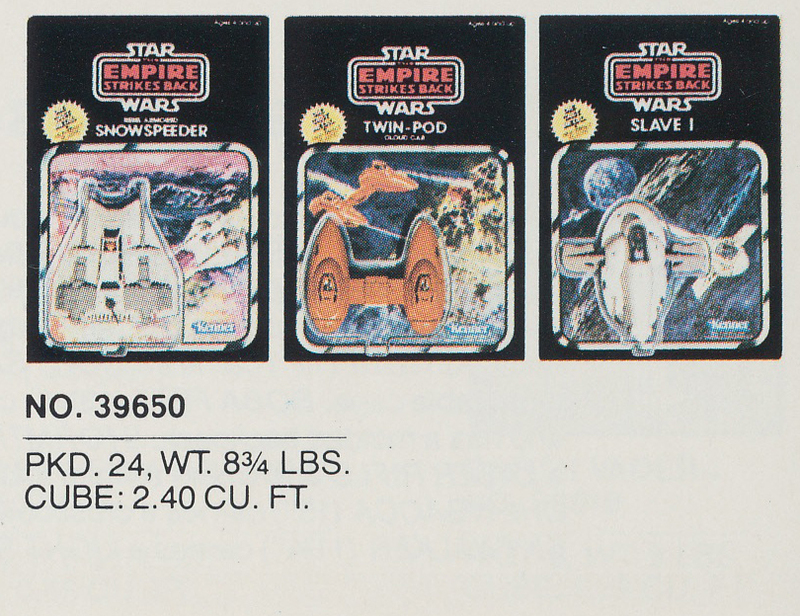 One photo shows examples of the Series 1 ships on Empire Strikes Back cardbacks including the Land Speeder and Darth Vader TIE. Is this a clue that the Land Speeder was released on the SW21 and ESB31 cardbacks, or more likely is this an image of unreleased samples? This image hosted by plaidstallions.com shows the 2nd issue header with the 1st issue bin - the 2nd issue bin appears to be very rare. 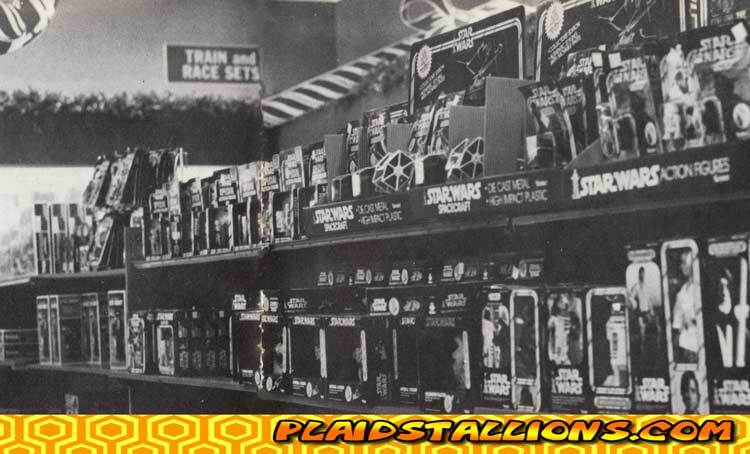 The full range of die cast Star Wars toys were not necessarily available in all stores as this limited display demonstrates - but the action figures still get a display bin! 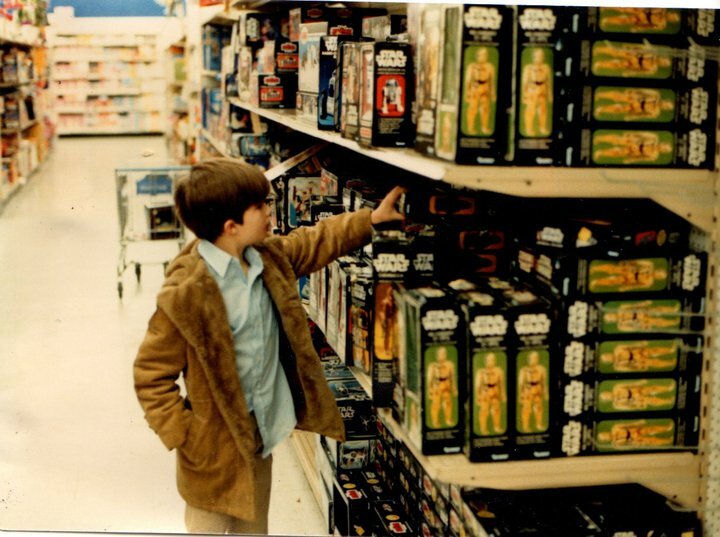 Of course most carded vintage Star Wars was found on pegs with less defined displays. 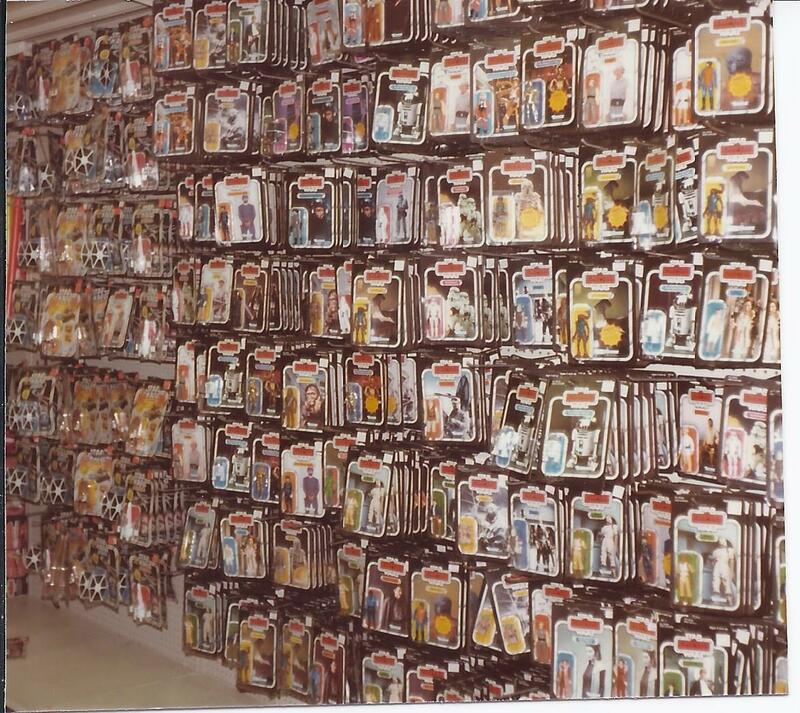 There is a mix of Star Wars and Empire Strikes Back die cast on shelves below this 'Collect all 41 Action Figures' hanger. Star Wars Land Speeders and Darth Vader TIEs can be seen alongside the Empire Strikes Back X-Wings and TIE Fighters - it seems unlikely that the ESB Land Speeder in Kim's image made it to stores. 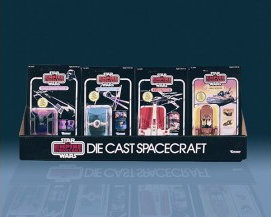 The general scarcity of Series 1 and 2 ships on Empire packaging is reflected in the store display below, with die cast Star Wars packaging seen alongside Empire Strikes Back action figures. No Palitoy display bins were produced for the die cast range but Kenner bins may have been used in the UK. This small Palitoy display is typical of that seen in local toy shops across Britain. Here Star Wars die cast and the first 20 action figures share shelf space with the 30 back Empire Strikes Back releases. Images of the Series 2 die cast ships in Empire Strikes Back packaging are hard to find - is that a shelf of TIE Bombers at the bottom of this image? If the owners of the above images would like any images removed please let us know. This website and the ships we know and love so well would not be here without Colin Cantwell, the designer and model maker behind many of the iconic ships that we saw on screen and were subsequently so faithfully reproduced in die cast metal and high impact plastic. Colin was the concept designer behind the X-Wing fighter, TIE Fighter, Imperial Cruiser and the Y-Wing Fighter. Colin also designed the Sky Hopper, Sand Crawler and the awe-inspiring Death Star, but unfortunately none of these were available in die cast in the vintage Star Wars toy line. Colin's other credits include 2001 A Space Odyssey and War Games. Colin was introduced to George Lucas by his friend Hal Barwood, with George being instantly impressed by Colin’s kit bashed models (models made from parts of other model kits). Once 20th Century Fox had agreed funding for Star Wars, George knew where to go when he wanted concept sketches for the space ships. ‘This is what had to compound itself in the first half hour of the film. It had to be all so absurd and different and insanely joyous and perilous that the audience wouldn't leave’. The ship was designed so that the viewer could really experience the massiveness of the ship. The X-Wing was the first Star Wars ship that Colin designed, an idea initially derived from watching darts being thrown in an English Pub. The TIE Fighter was the last ship that Colin designed, and it was made from cut plastic sheets. To achieve this the TIE was kept out of the opening of the film, and an air of mystery was always maintained. ‘There were constraints regarding what it could or could not be seen doing. It was in the script that it could not be used in the same kind of shots as other ships. It had to emerge from its den fully formed and fully armed.’ It was never to be seen leaving its hanger or with pilots accessing it. Colin also designed the Death Star and his brief from George established that the Death Star was to be a globe of small world size. Colin also designed a lizard-shaped Millennium Falcon, a design that was subsequently scrapped as it was too close to another studio’s design. We asked Colin if he was aware of the 1970s die cast toys based on his designs. All images here are copyright Colin Cantwell. 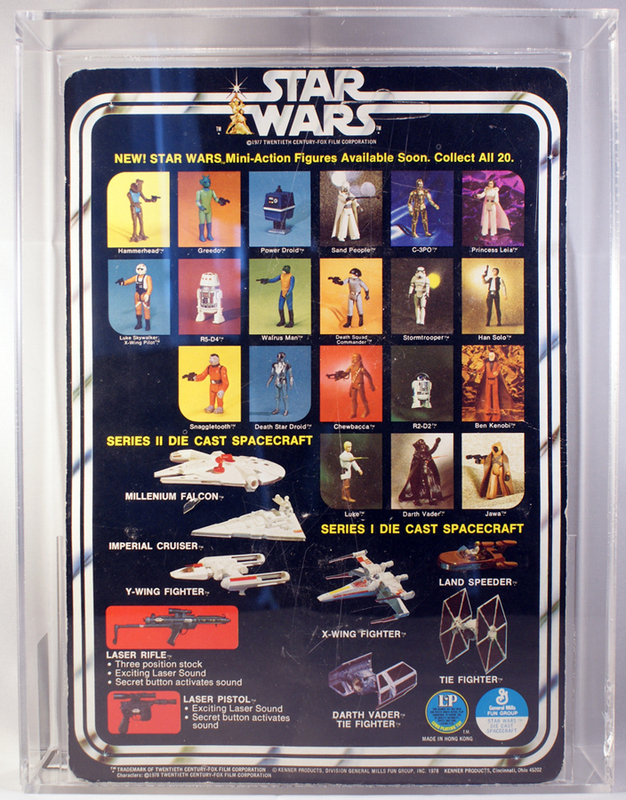 Variations are a big part of vintage Star Wars collecting but have yet to impact on the die cast scene. 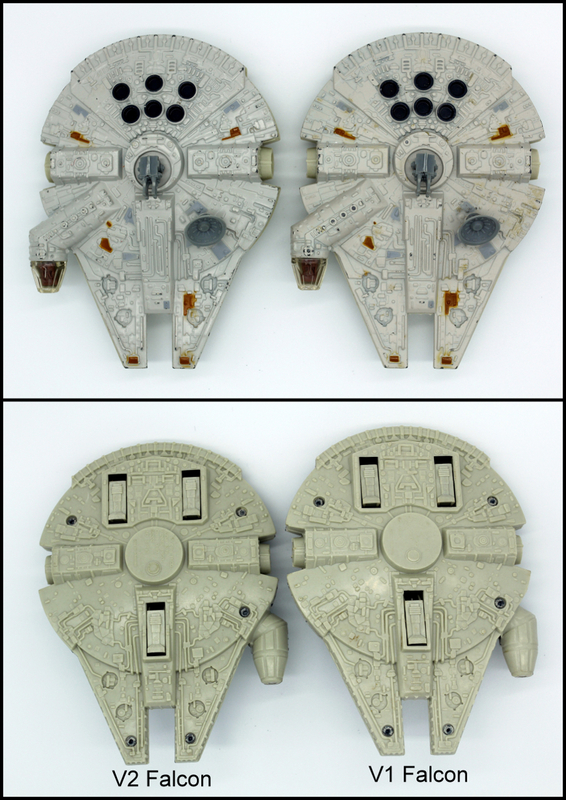 Justin Lea, regular contributor to the Vintage Star Wars Die Cast website, wonders why that is and gives us his insight to those variations below. If you know of any other variations please get in touch. Loose figure variant collecting over the past ten years has surged to the point of collecting different facing eye balls, yet the unloved eleven that make up the die cast line have remained relatively untouched by eagle-eyed variant collectors. Is it that as there are only eleven 'boring' out of scale vehicles to collect collectors feel uninspired to pursue these slight differences? Did the trauma of receiving a die cast X-Wing for Christmas instead of a large scale toy stick for a lifetime, and cloud collectors' future habits? Probably not, but whatever the reasons, many collectors do shy away from the die cast line. Differences in sculpts of seemingly identical toys are a result of different factories using differently tooled steel moulds to produce the toys, or moulds being replaced during the lifetime of a toy. Die cast vehicles were either made in factories in Macau or Hong Kong, with the 11C and 11D card backs having a small 'U' or 'MB' added to the racetrack on the rear depending on whether they were made in Hong Kong or Macau. Cards with no letter (including the 11C) are all made in Hong Kong. Loose die cast collecting is an affordable and relative safe toy line to collect as prices are low and reproduction items are limited to the smaller accessories like the Y-Wing bomb, Land Speeder windshield and the Imperial Cruiser's Blockade Runner (see Reproductions above). Variants within the line are fairly easy to spot in person or by viewing good quality pictures. Finding variants in high quality condition is challenging, as most have been played with and show the usual signs of paint chips or flaking. 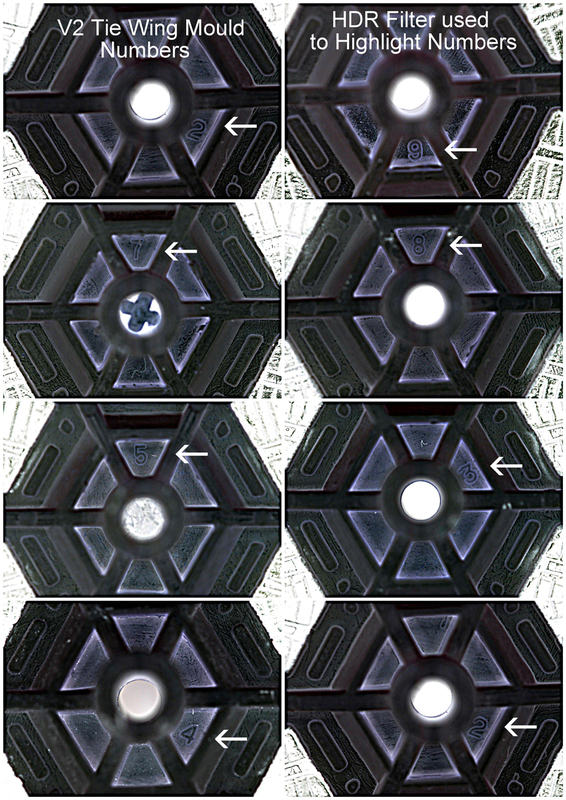 The images below show the currently recorded major variants and minor variants. 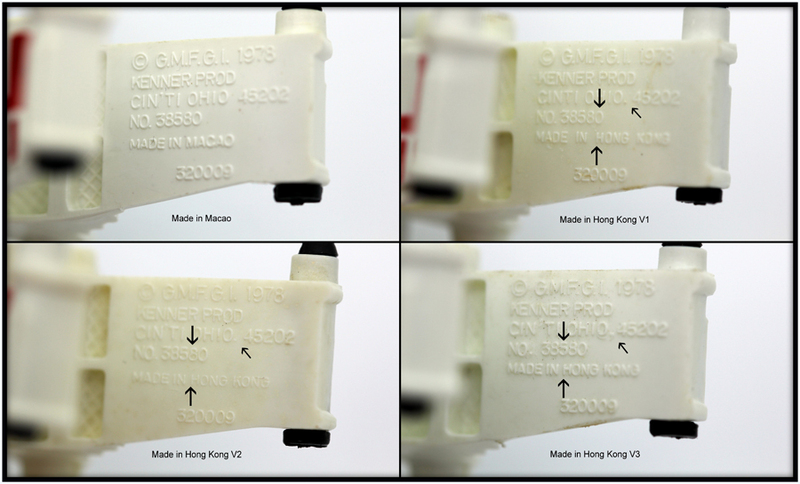 Major variants include distinct mould differences, countries of origin (COO) and major paint applications. 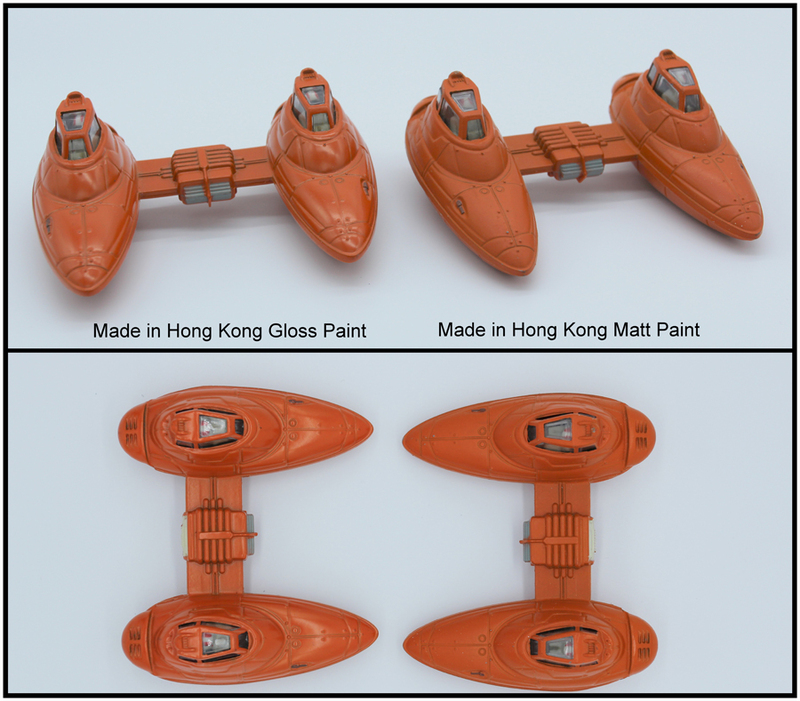 Minor variants include minor mould differences and some paint/colour applications. Note that some minor colour variations have been left out, as a list of shades of Cloud Car orange would clog up the internet. 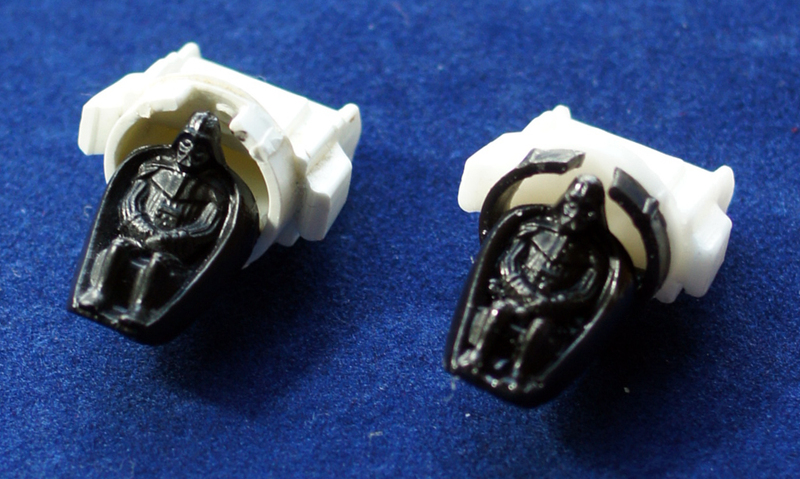 There are no major COO or mould/cast variations for the Land Speeder. The only minor variation is the paint application; the Land Speeder's body colour seems to have remained a constant colour yet the body pin stripe has two colours variations. 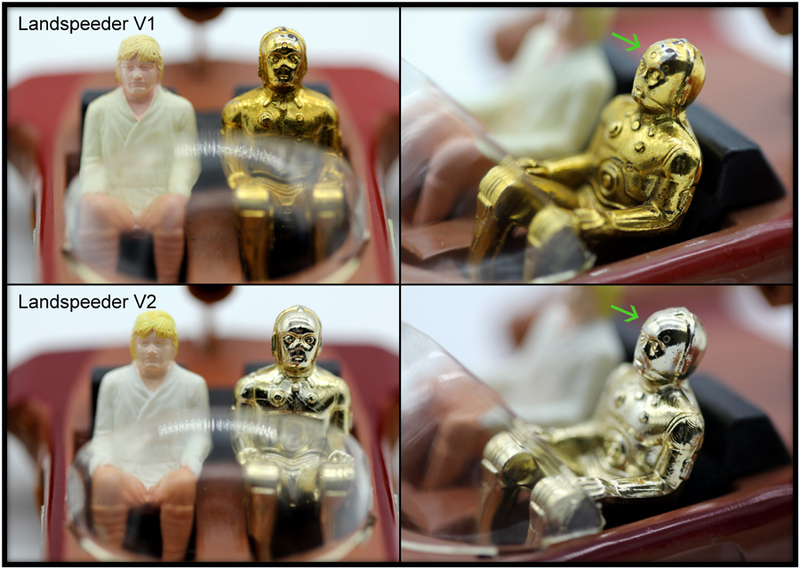 The Luke and C3PO miniature figures do have minor mould differences and paint applications. The C3PO vac-metalized gold colour can be distinctively different. X-Wing major variations can be seen in the following four examples. 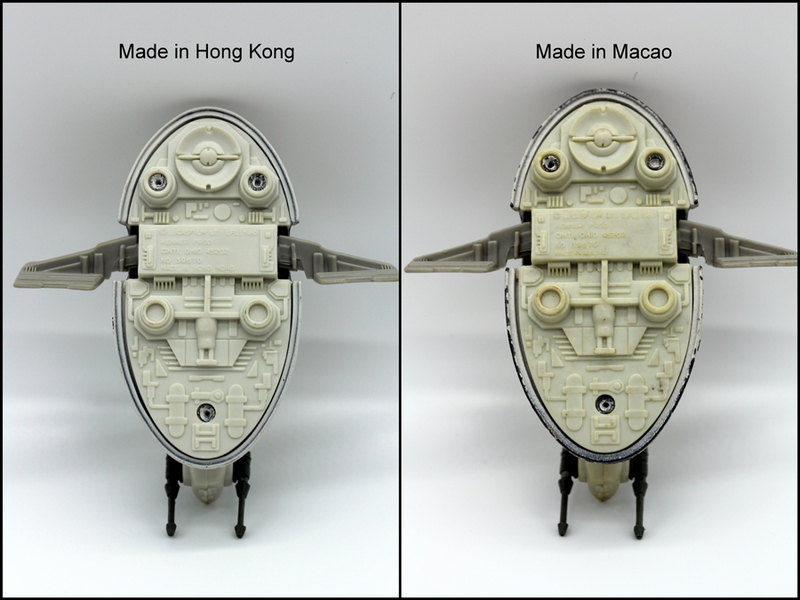 Made in Hong Kong V1, V2, V3 and Made in Macao have distinctive mould differences on the wings and COO markings. There are no major body variations for the vehicle. TIE Fighter major variations can be seen in the following two examples. 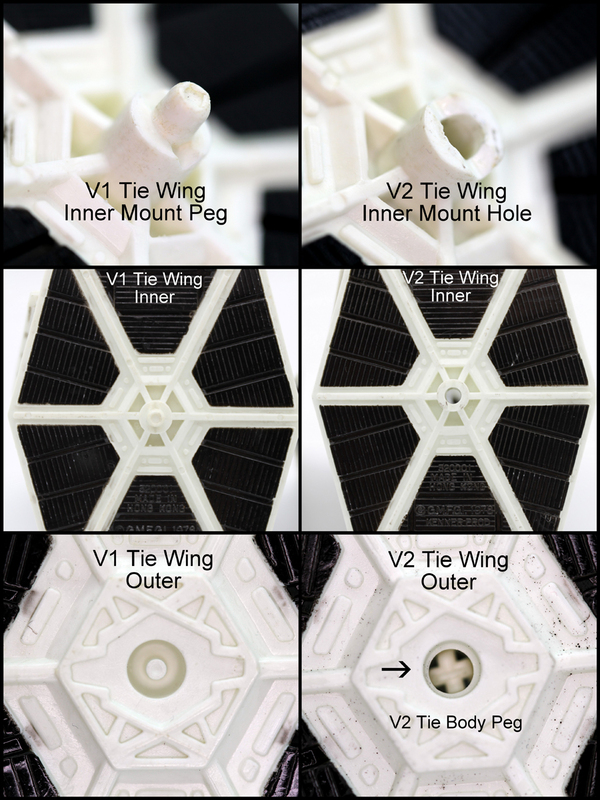 There are no major cast variations found for the TIE body except for the introduction of the peg/dowel system as detailed on the TIE Fighter Page. 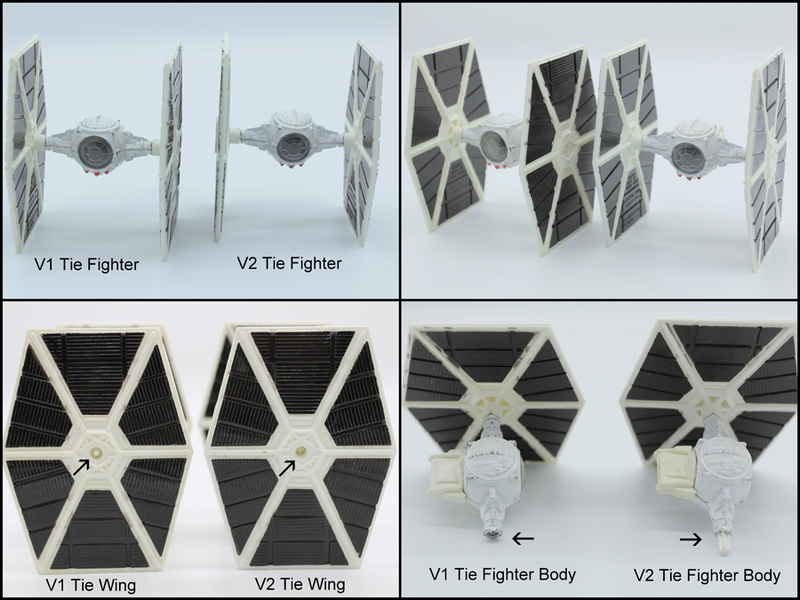 The V1 TIE Fighter body and wings have a different mounting application to the V2 example. The TIE V1 wing has a peg/dowel as a part of the wing that fits into the V1 TIE body with a locator grove to hold the wing in place. This design was soon improved to the V2 that has a separate dowel glued into the TIE V2 body, and which slots into a TIE V2. The V2 wing has a cavity to locate the dowel and locator grove to secure the wing. The TIE V1 and V2 wings have slight mould variations that can be hard to see. 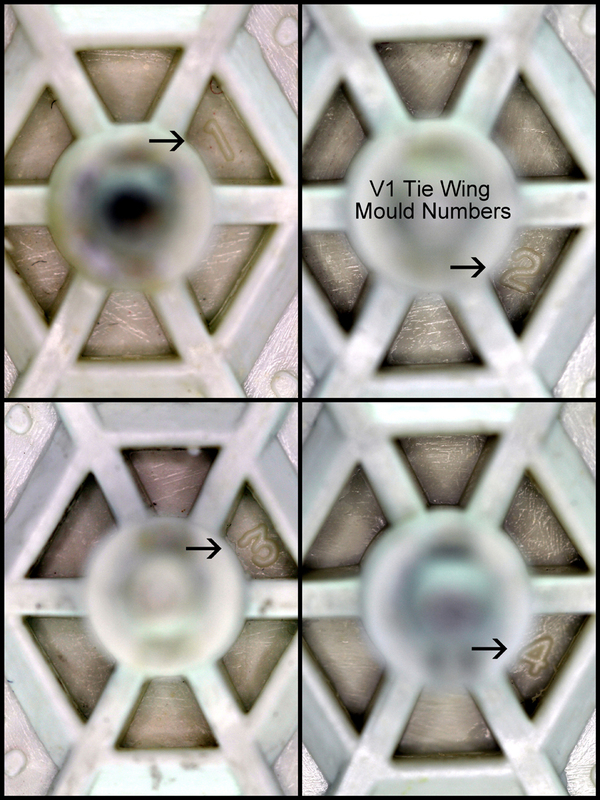 The best way to find the slight variations is to look for the mould numbering found on the inside of the wings. COO lines are placed slightly differently on the V1 and V2 wings. 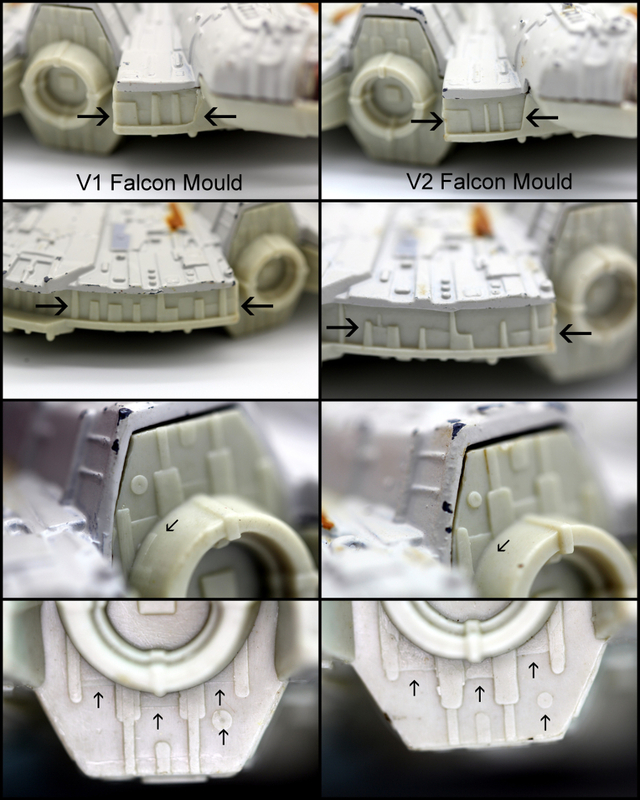 Major variations of the underside of the Millennium Falcon mould can be seen in the following two examples. 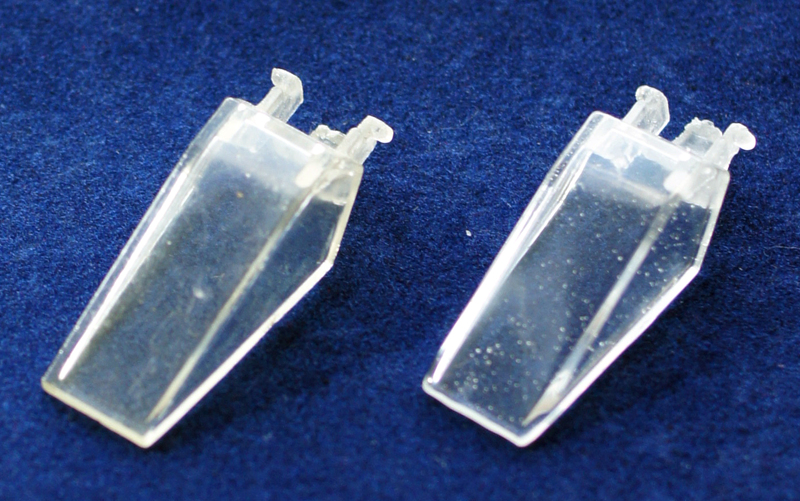 There are no major variations of the mould for the upper part of the vehicle. The mould variations can be easy to spot by comparing the copyright text. V1 mould has no comas after each 'PROD' whereas V2 has comas after 'PROD'. The images below detail the different mould features and copyright line spacing. There are no major COO or mould/cast variations for the Cloud Car. The only minor variation is differences in the paint application; whilst there are many shades of orange, only the gloss and matt finish examples have been shown below. Slave 1 major variations can be seen in the following two examples. 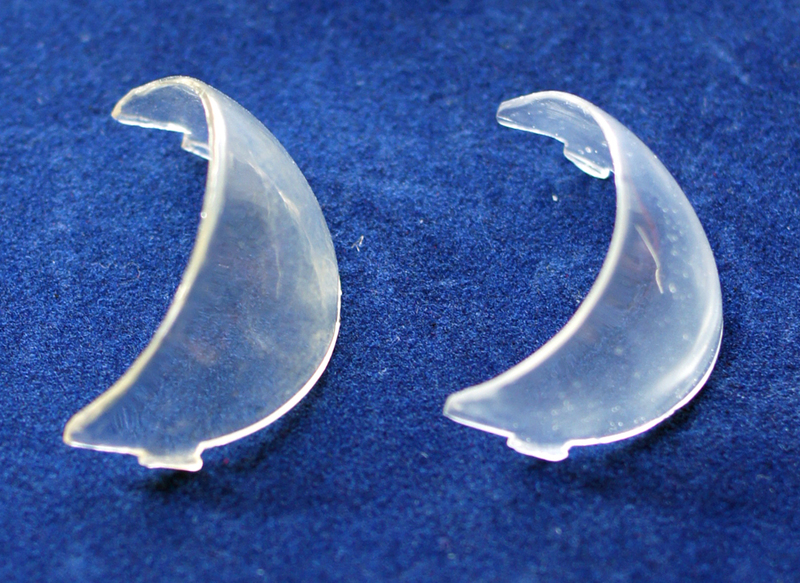 Made in Hong Kong and Made in Macao have distinctive mould differences on the side wings and COO markings. There are no major variations of the body cast for the vehicle. 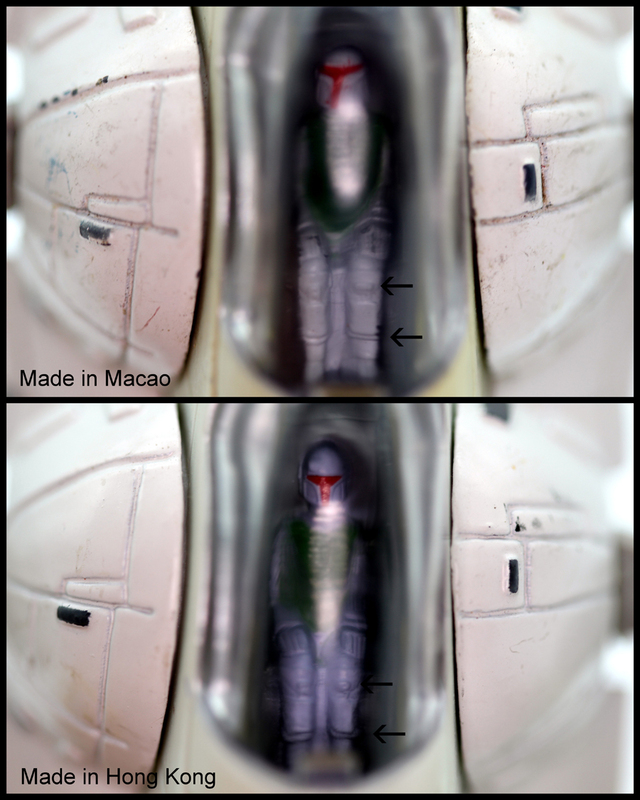 The miniature Boba Fett mould has slight differences between the Hong Kong and the Macao examples. Snow Speeder major variations can be seen in the following three examples. 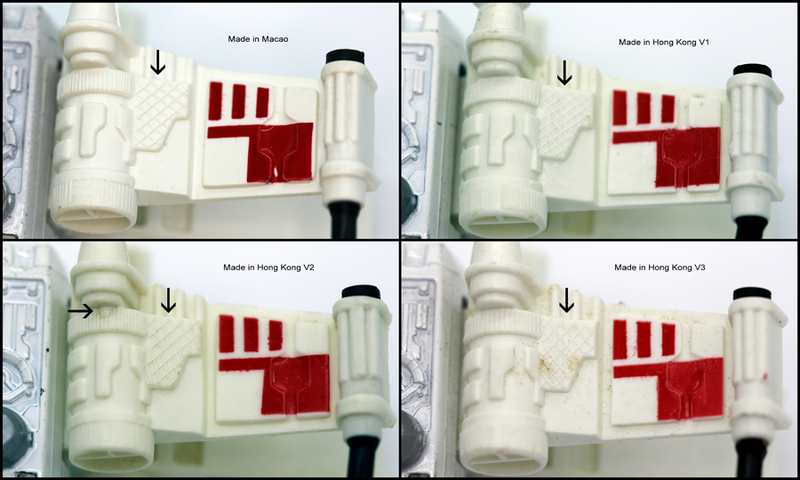 Made in Hong Kong V1 and the Hong Kong V2 have distinctive mould/cast differences that can easily be identified. 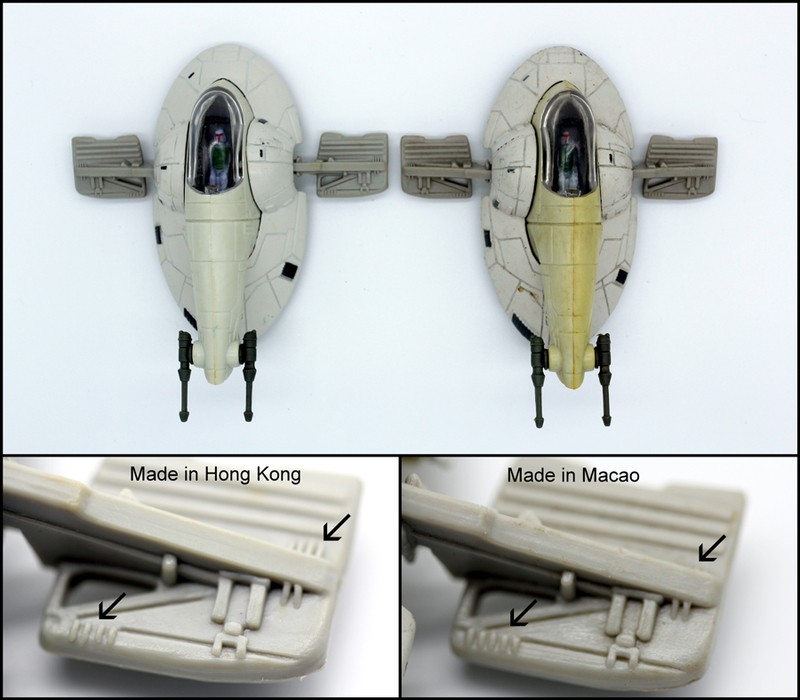 The Made in Macao example has the same mould/cast as the Hong Kong V2 except the Country of Origin marking has been changed. 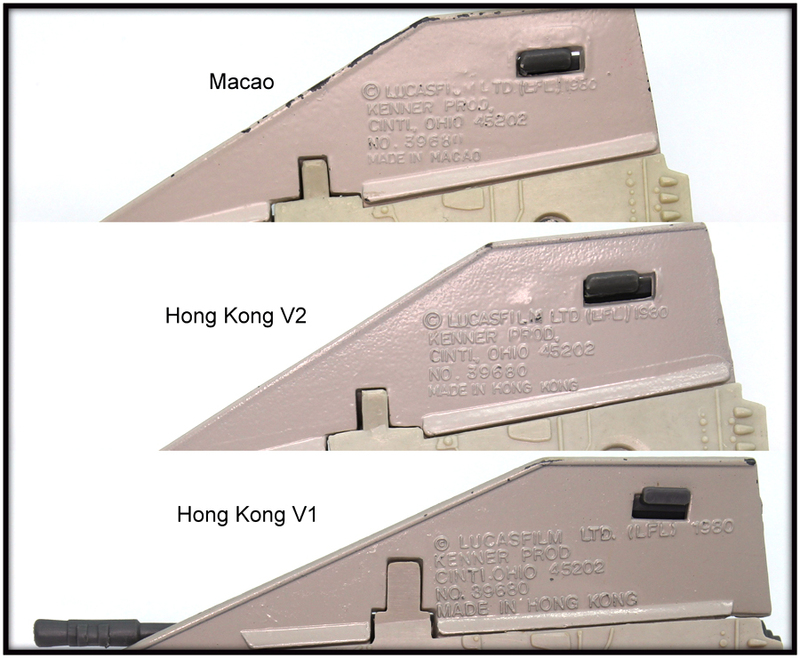 Its possible the same tooling used in both countries at separate times with Macao being at the end of the line.